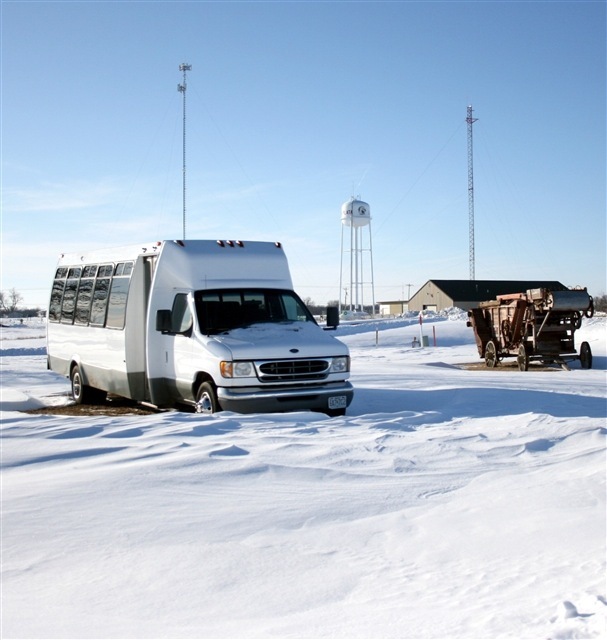 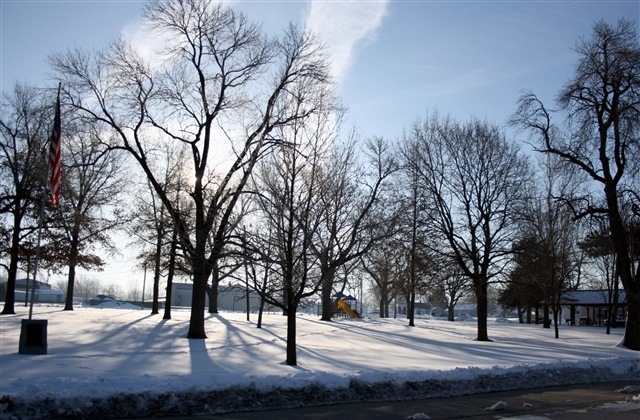 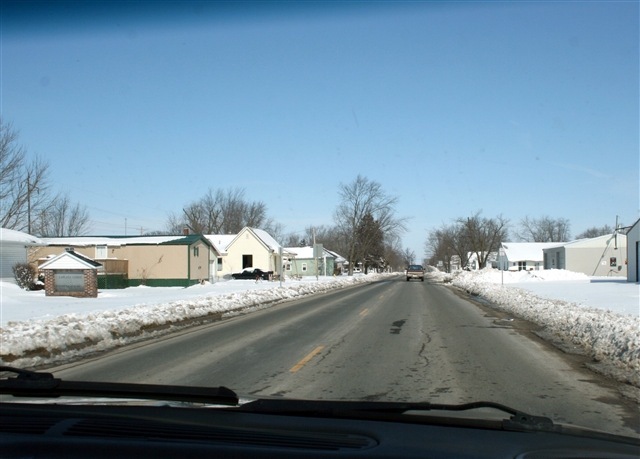 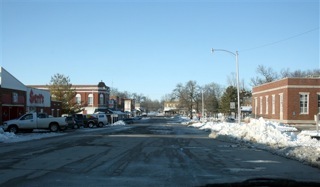 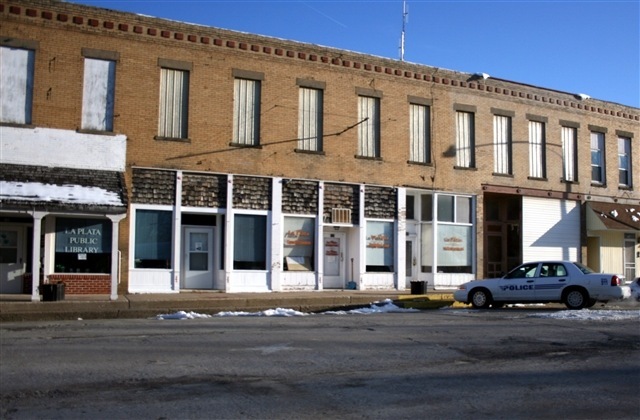 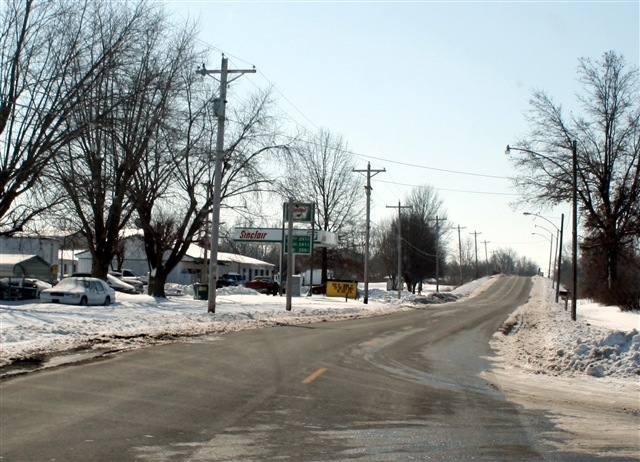 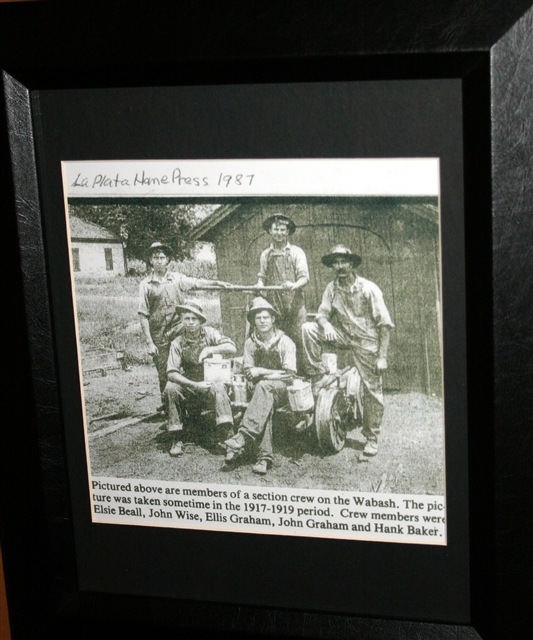 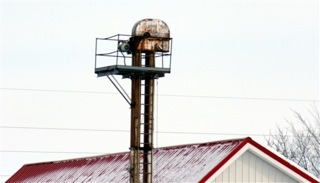 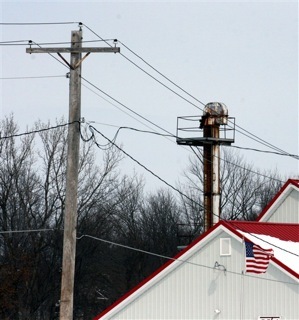 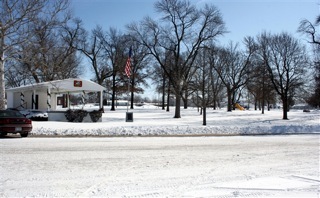 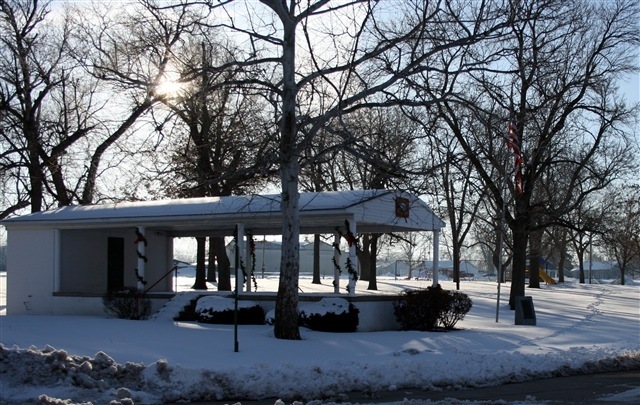 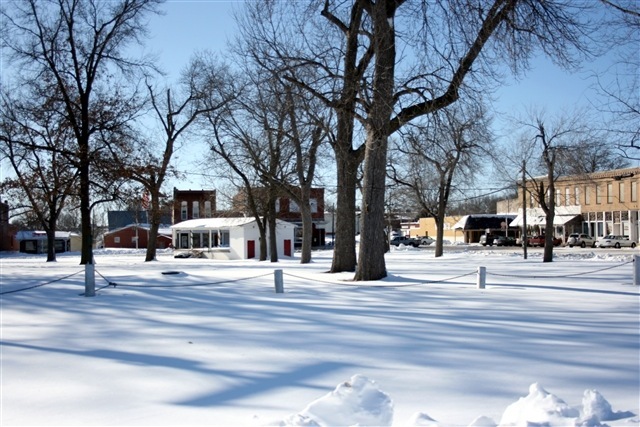 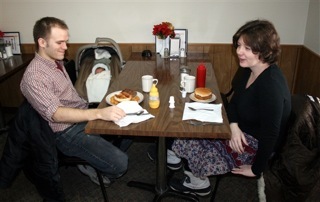 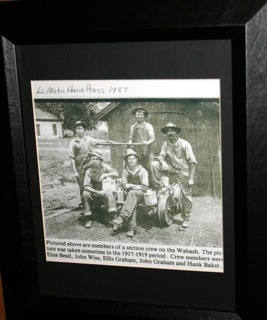 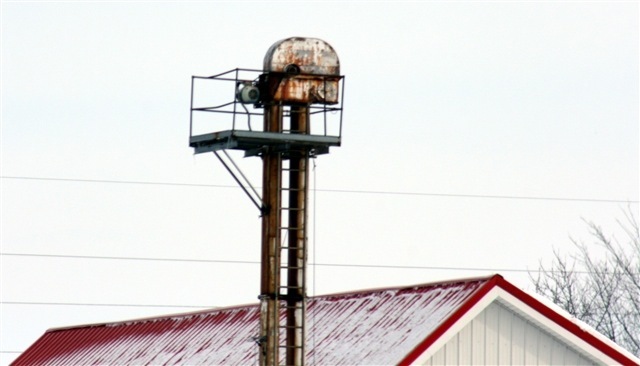 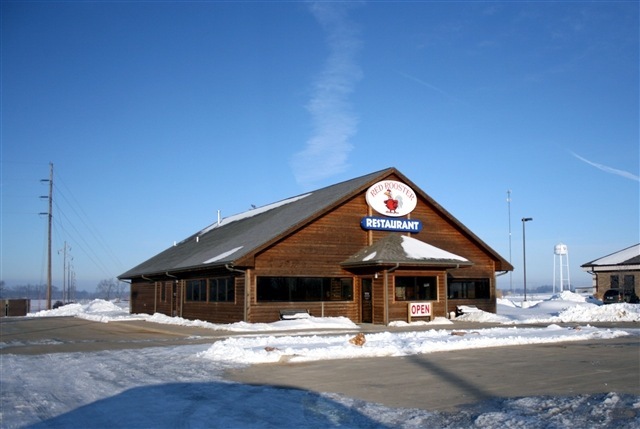 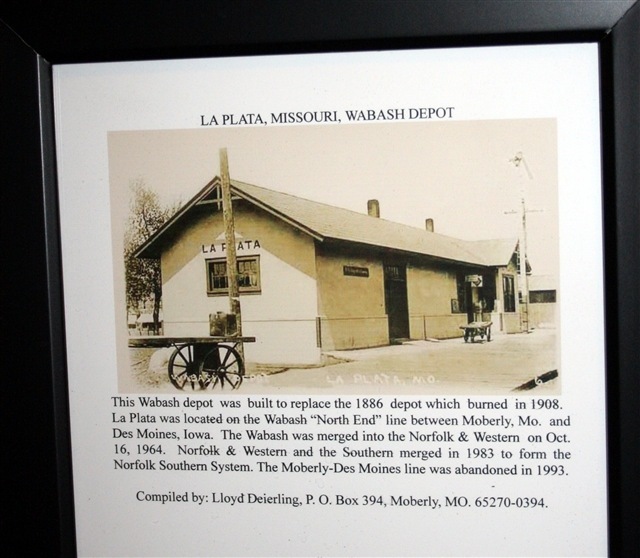 This part of the travelogue and Part 3, takes place in La Plata, Missouri. 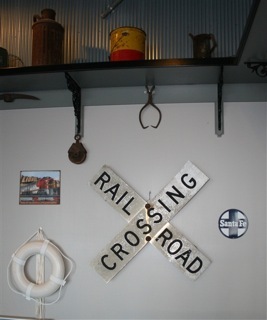 Follow my camera around the Depot Inn and Suites, viewing many of the railroad artifacts displayed along the hallways and swimming pool area. 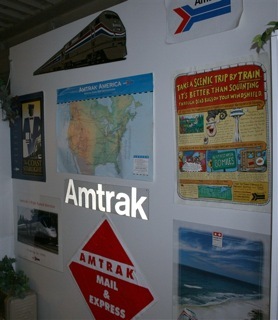 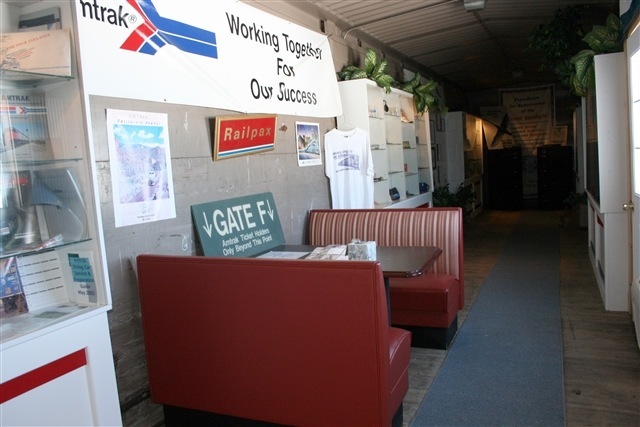 We will trudge through the snow into old mail cars now an Amtrak memorabilia museum and model train display. 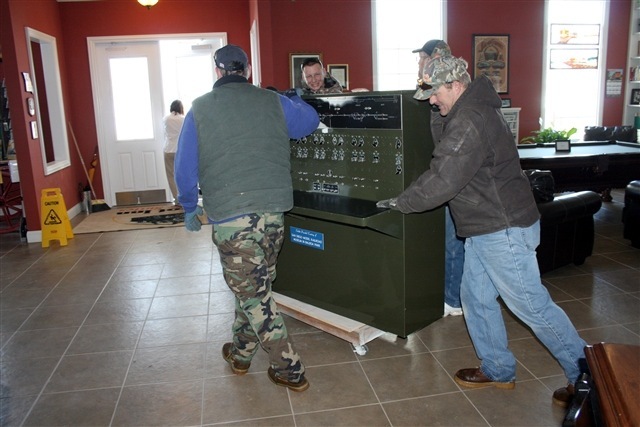 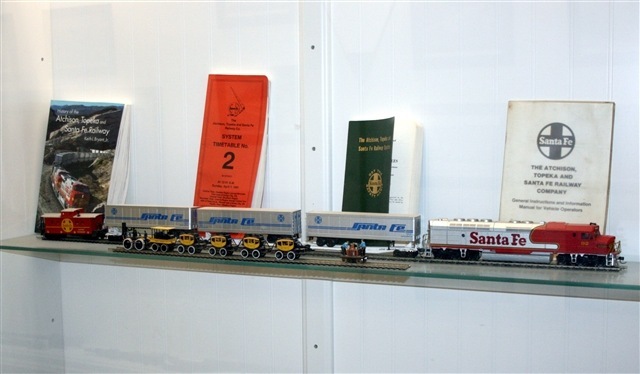 History is made as the heavy Santa Fe Train Dispatcher’s Board is moved from the Depot Inn to the Silver Rails Gallery of railroad art. 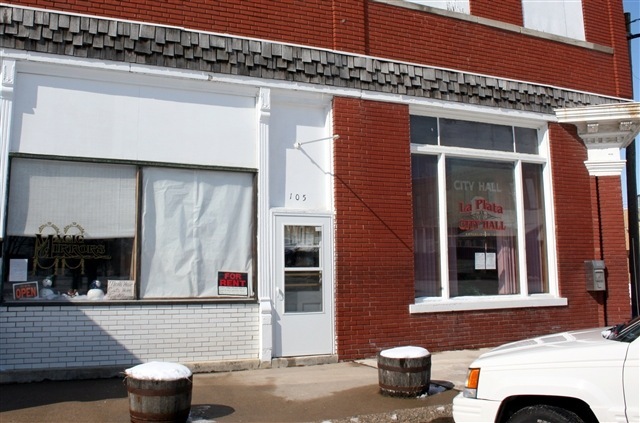 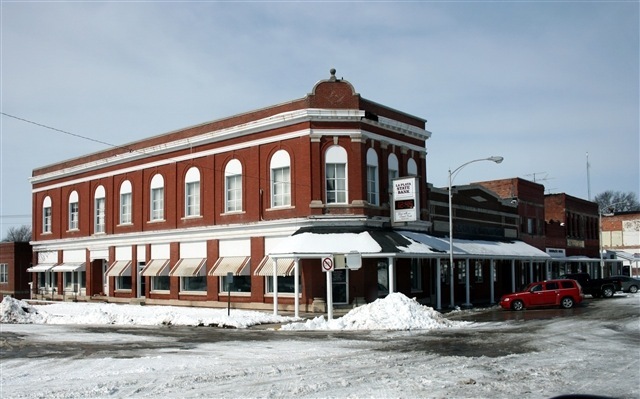 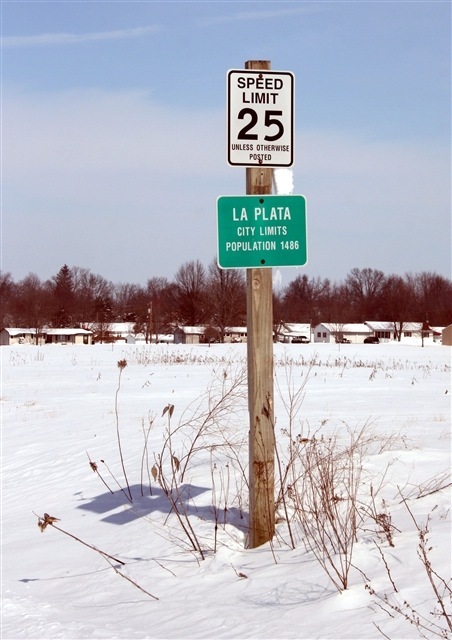 Also we will journey into the town of La Plata for luncheon at Grandma’s restaurant, check out the surrounding streets, and take an inside the building look at the Train Party office and warehouse. 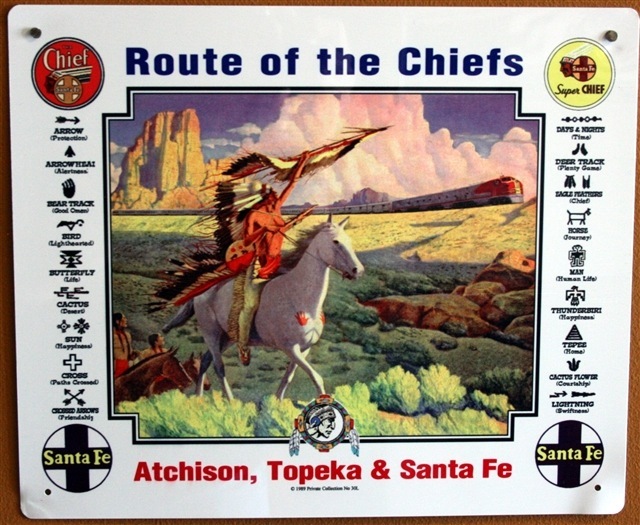 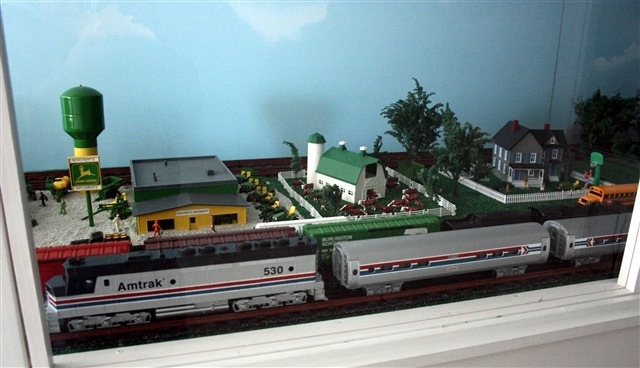 Part 3 will also be in La Plata with travels to La Plata’s Amtrak train station, the Chris Guenzler train Lookout and a road trip to Marceline, Laclede, Atlanta and Santa Fe Lake. 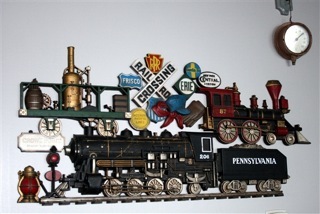 Part 4 takes me home to Pennsylvania. The weather gave day one a rough start, nevertheless, it quickly turned into a good one. 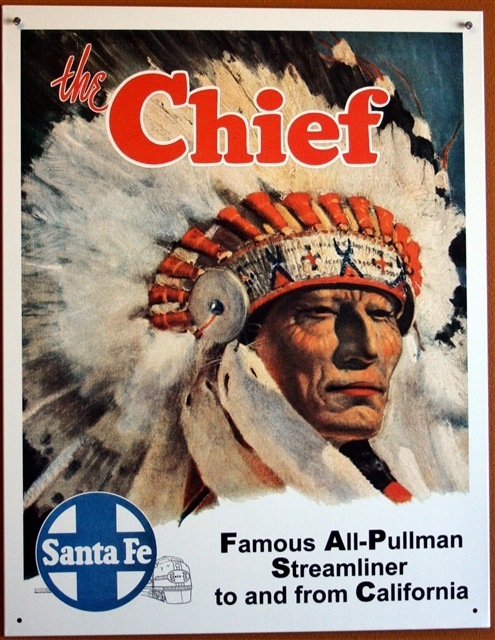 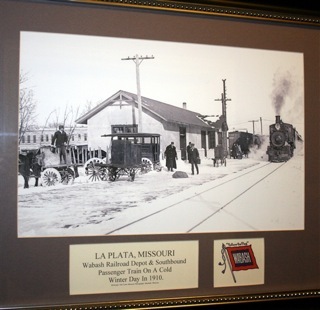 Having endured over two feet of snow the week before, La Plata did not need another foot accompanied by freezing temperatures the night I arrived on the Southwest Chief. Coming from Pennsylvania, I was acquainted with such weather. However, I had not invited it along on my vacation! 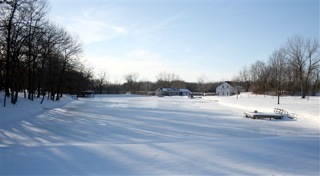 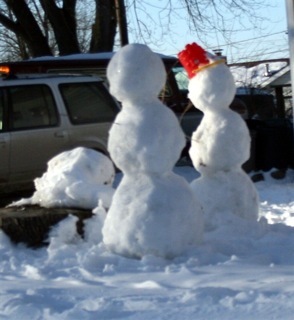 Additionally, the abundance of snow made for photos lacking in color as well as difficult lighting situations. 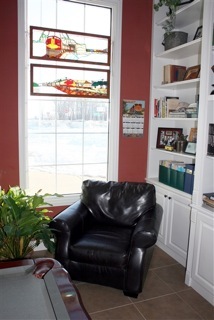 With these thoughts that first morning, I left my room to head for the front desk of the Depot Inn & Suites. 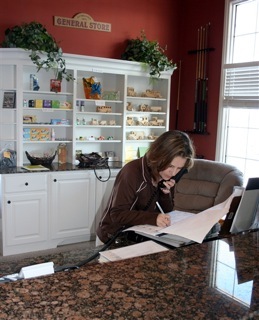 The lovely Andrea was on duty. 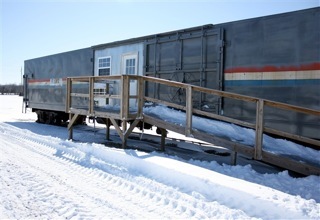 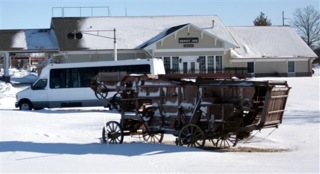 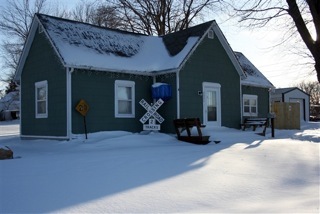 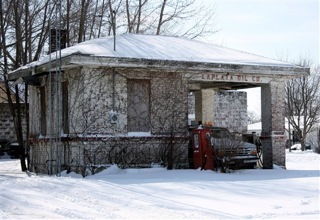 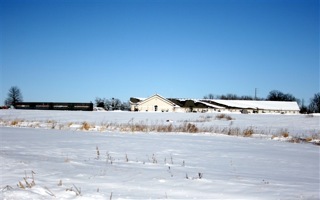 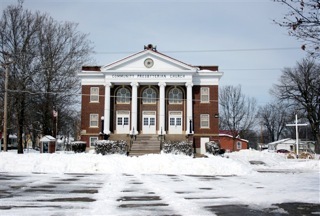 However not so lovely, was her news that the train Lookout and Amtrak museum were inaccessible due to deep snow. 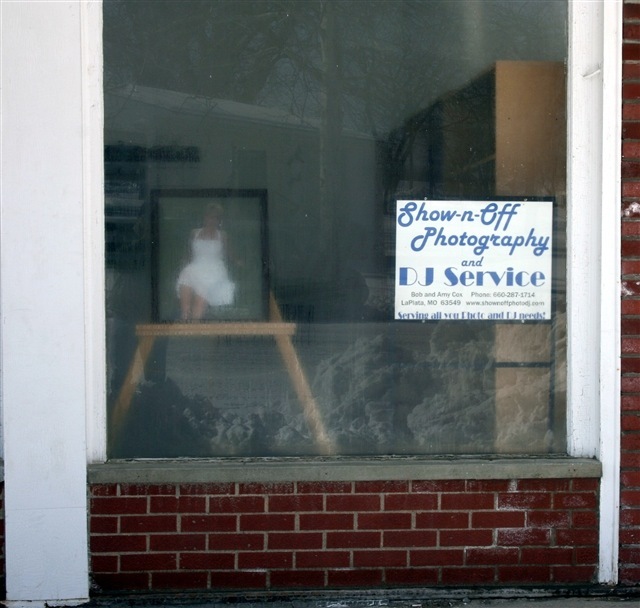 This was indeed disappointing to hear. 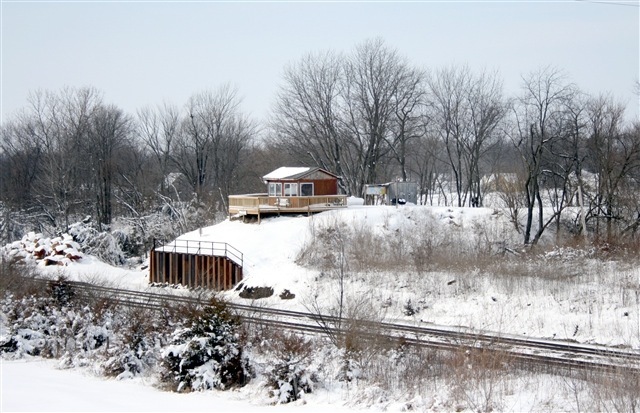 The Chris Guenzler Lookout is a wondrous place for any rail fan with reportedly about eighty trains passing daily (I did eventually get to the Lookout - see part 3). 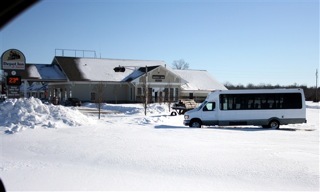 or have an Enterprise rental car delivered from nearby Kirksville. 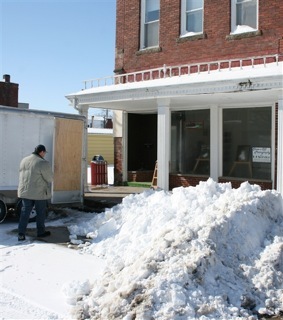 A peek out the front door though, made it apparent that snow drifts and temperatures would have me spending most of the day inside. 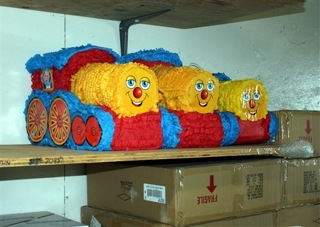 Oh well, I resolved to make the best of it, lemons into lemonade and all that good stuff. 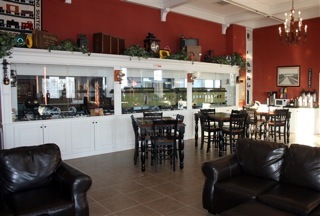 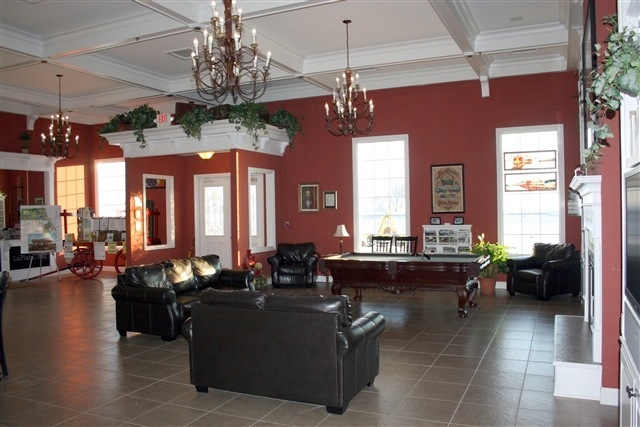 Meandering about the lobby, I noticed and remembered that the Depot Inn provides continental type breakfasts with hot or cold cereals, muffins, bananas and apples with hot tea and coffee available 24 hours. 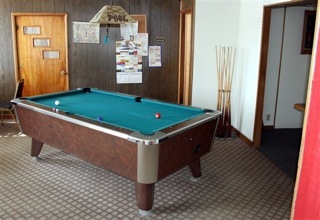 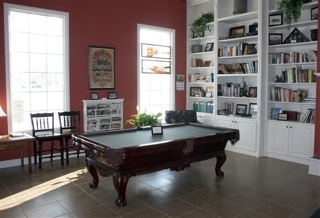 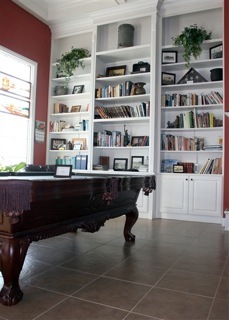 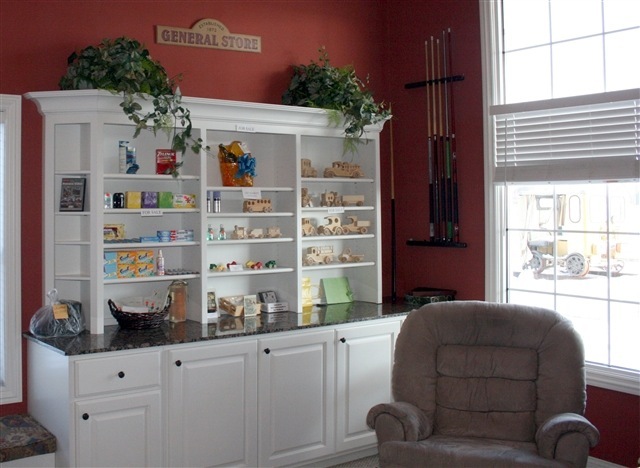 Notice that a pool table is available as well as tables for board games and cards. After hot oatmeal with banana and a cup of coffee, a little shopping in the General Store found a neat Depot Inn T-shirt and souvenirs. 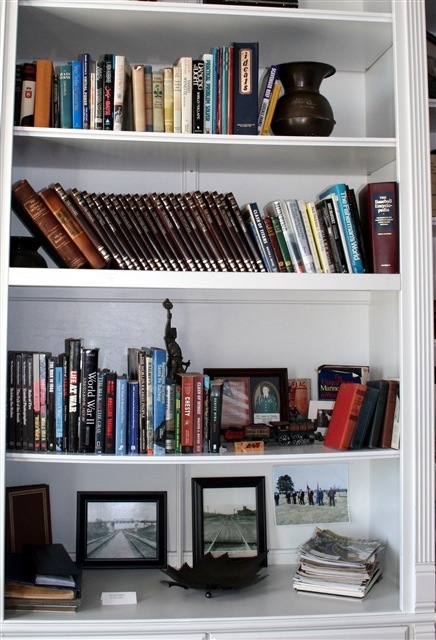 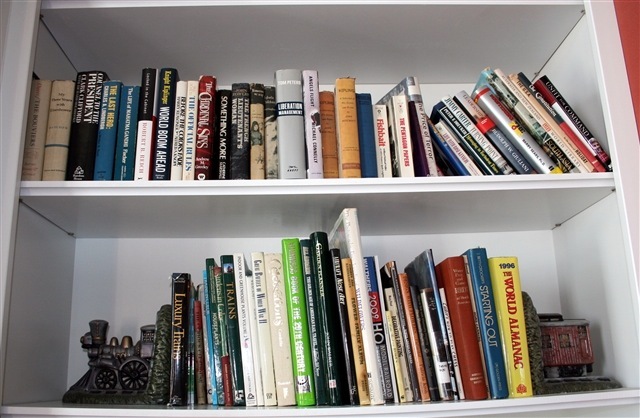 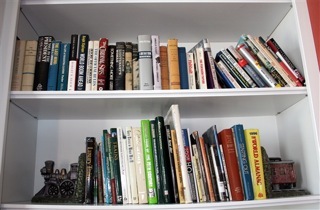 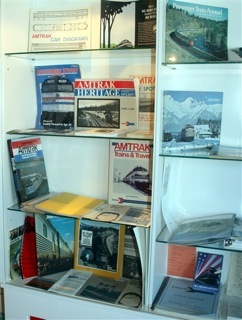 The other side of the lobby holds an outstanding library of mostly train books. 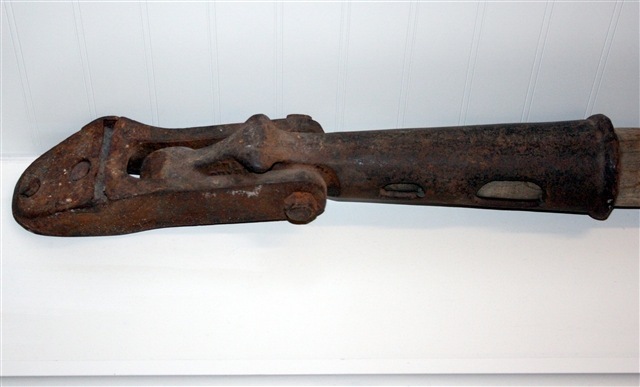 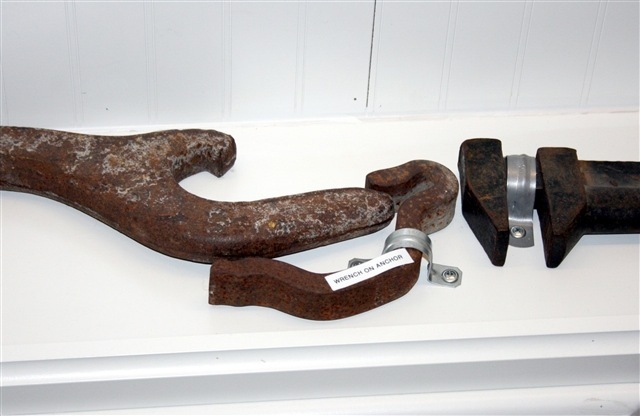 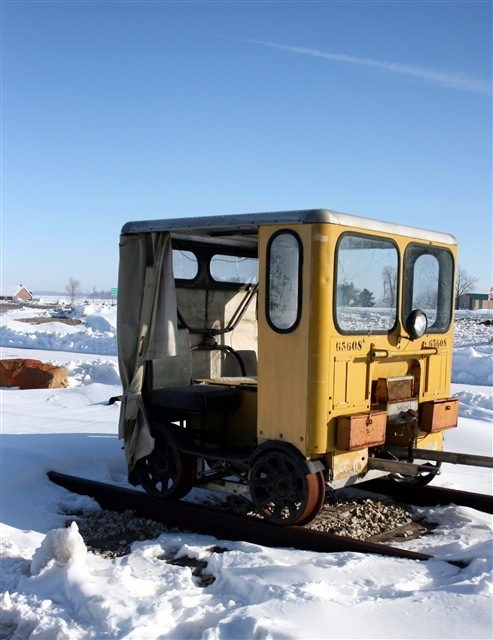 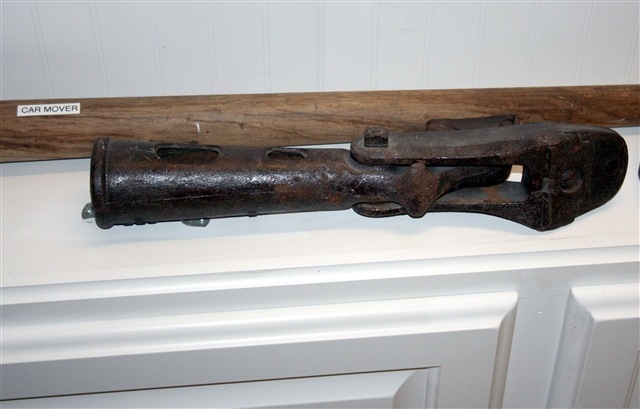 Giving closer examination to the many railroad relics and heirlooms on display, I began to realize that the snow situation may actually have been a good thing. 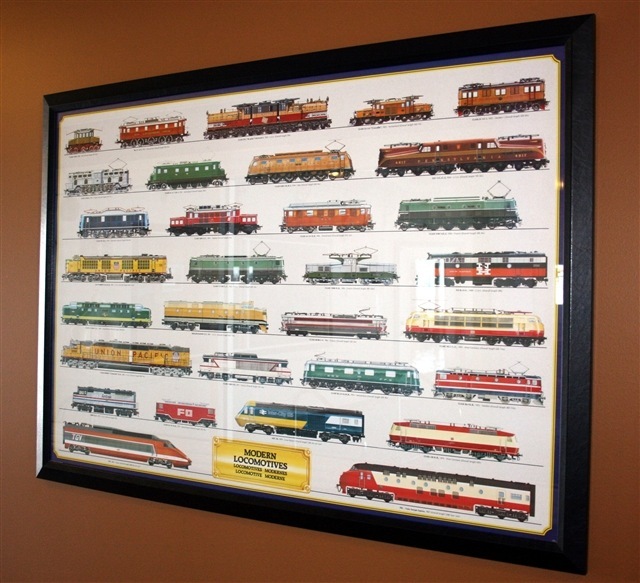 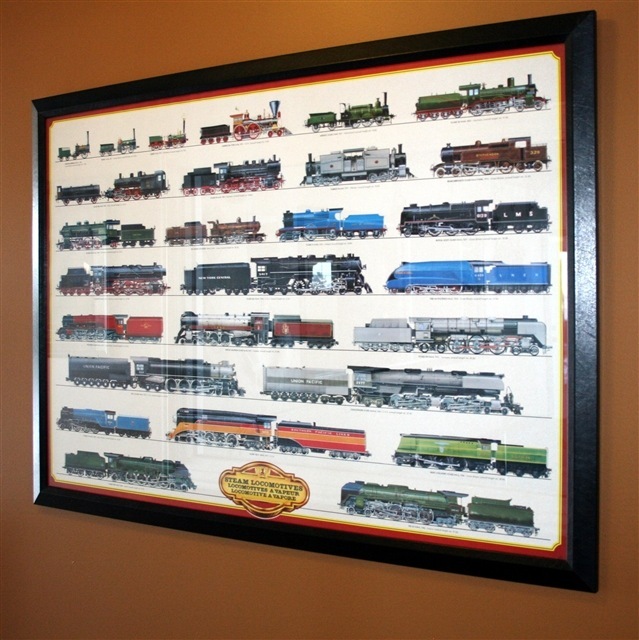 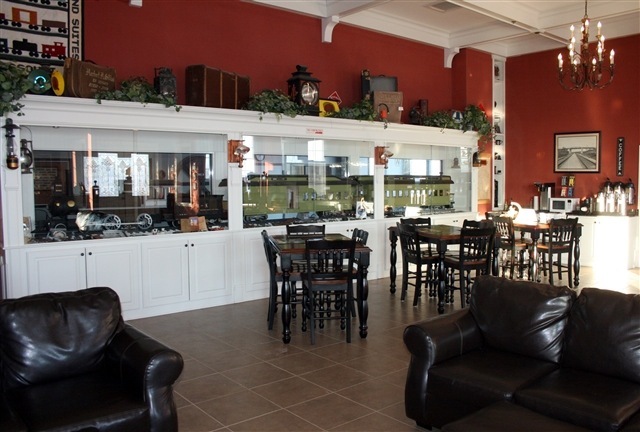 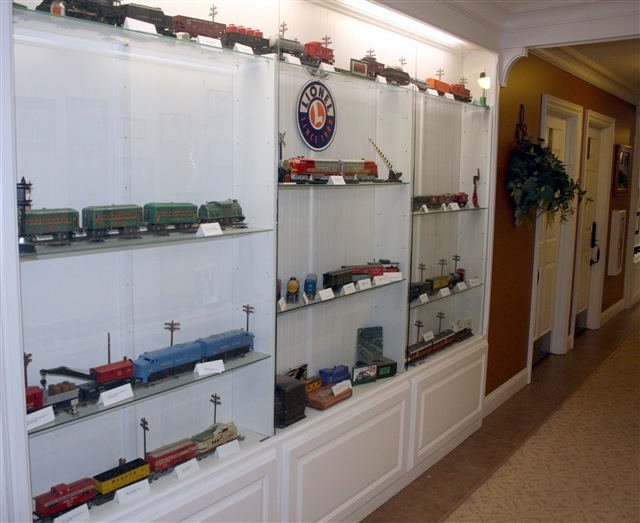 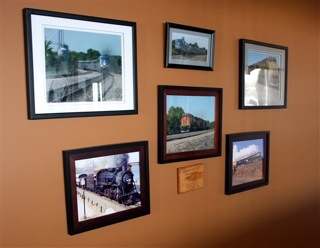 In fact, the Depot Inn & Suites could easily add “railroad museum” to the end of its name. 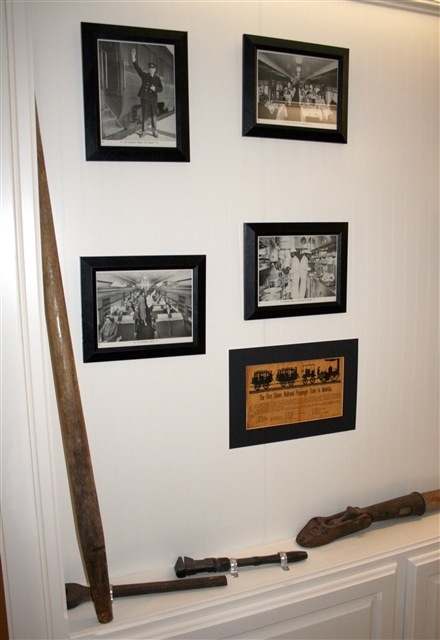 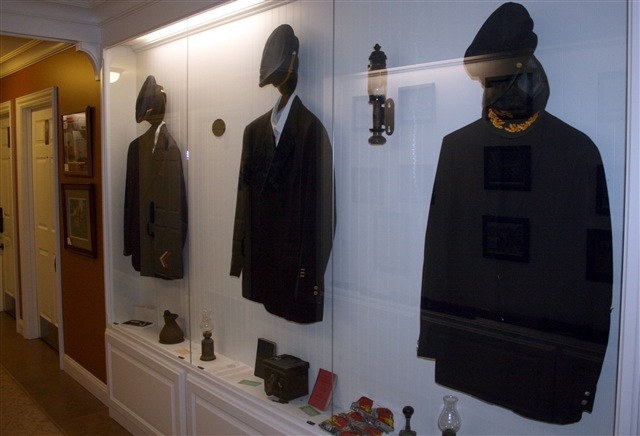 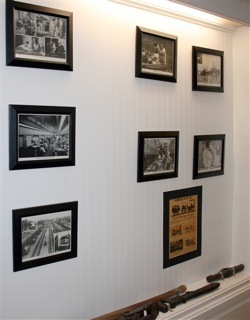 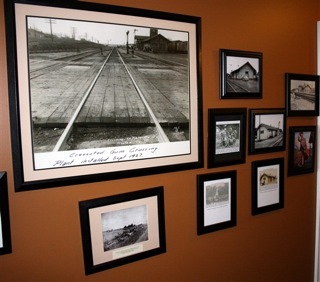 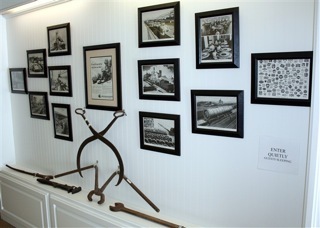 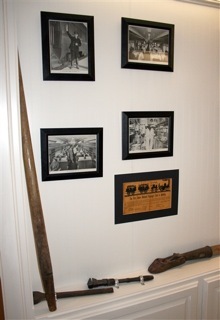 The hallways abound with numerous railroad related photographs and mementos. 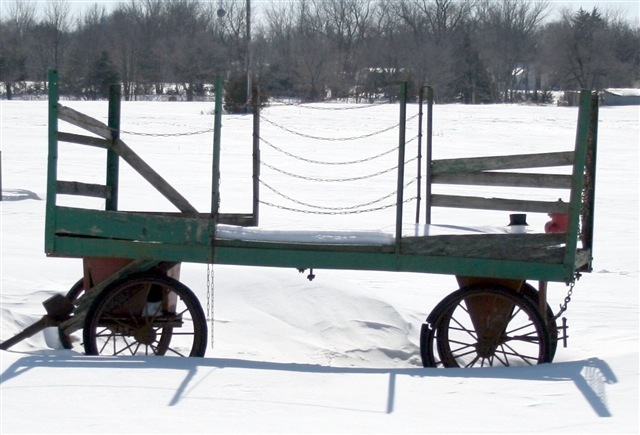 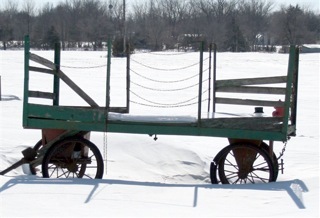 A glance out the back door revealed an old baggage cart standing lonely sentinel in the drifting snow. 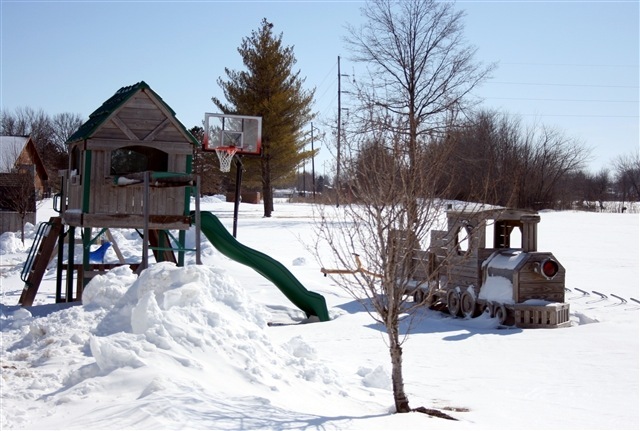 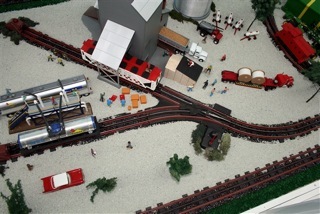 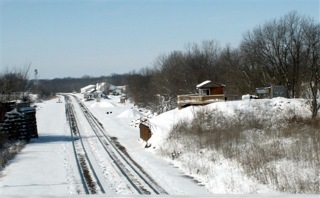 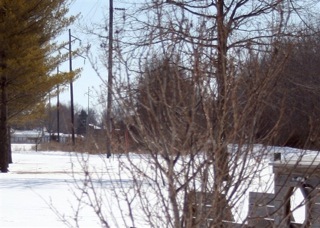 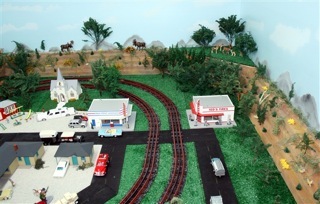 The playground held a wooden locomotive which, if one looks closely beyond it, a passing intermodal train (lower left) and the pathway to the Lookout (right) can be seen. 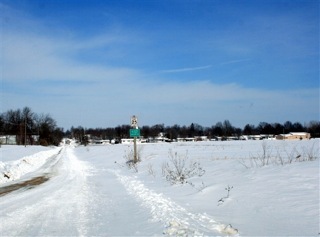 So close and yet so far away when snowbound. Strolling the hallway past the themed suites. I headed back to my room to watch trains passing the Lookout on the closed circuit TV exclusive to the Depot Inn. 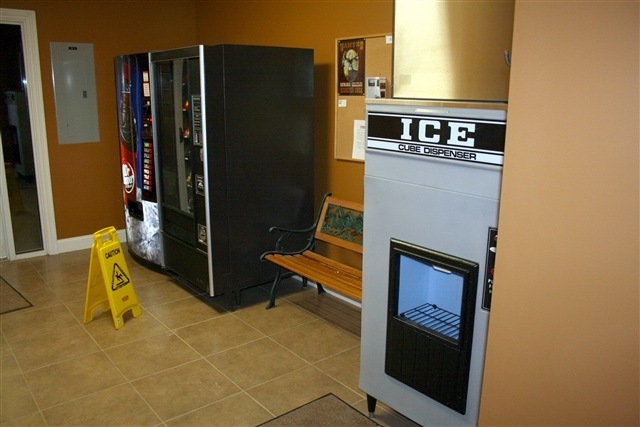 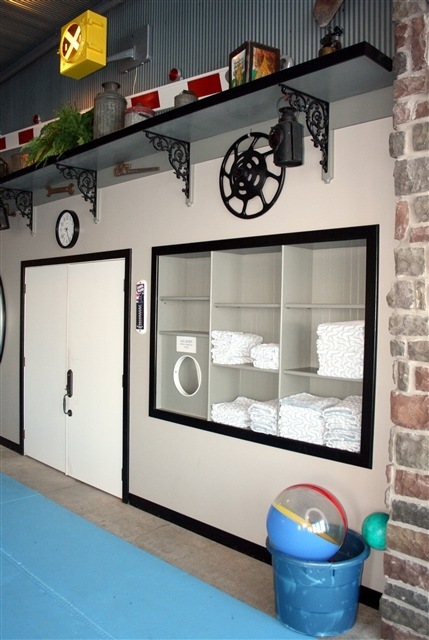 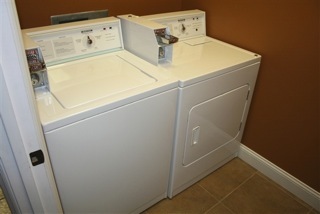 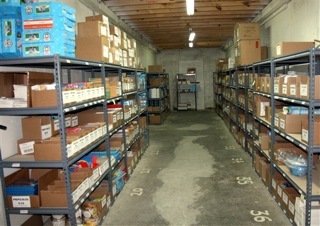 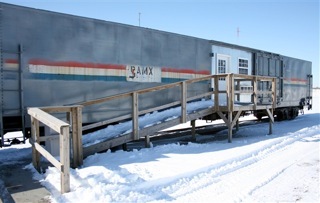 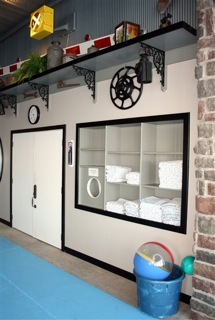 Near the rooms are ice and snack machines as well as a laundry room. 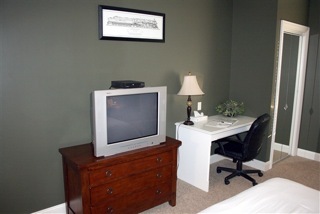 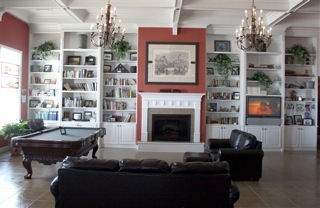 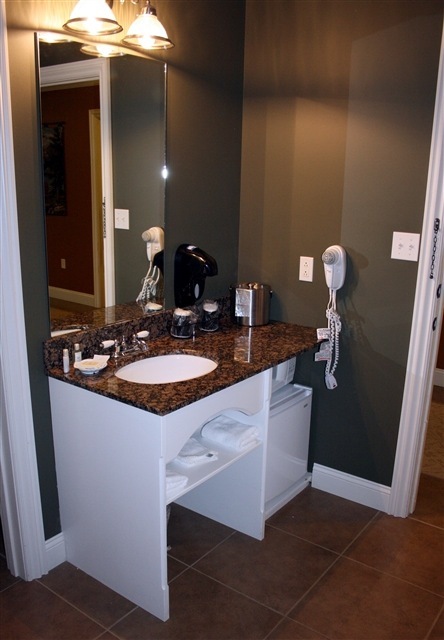 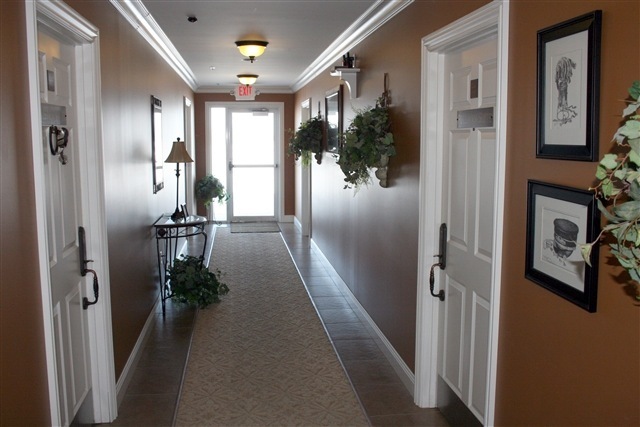 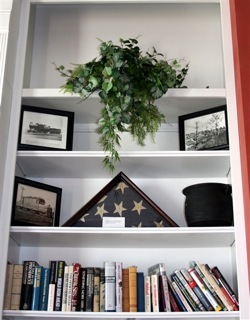 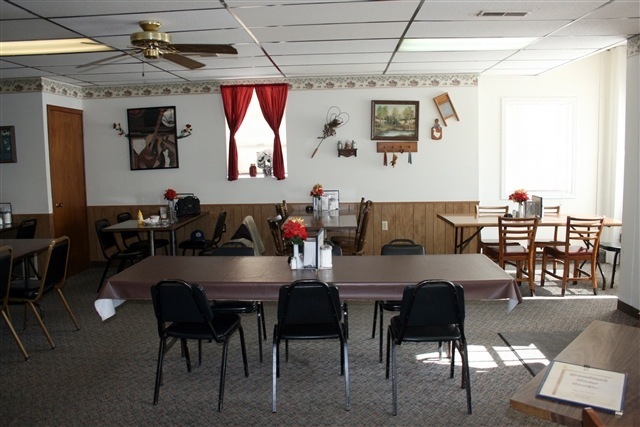 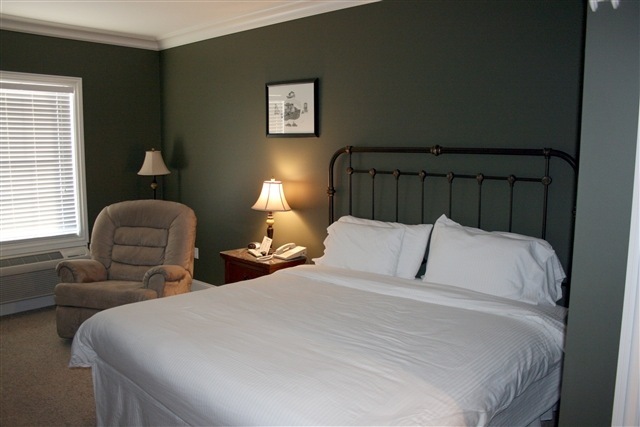 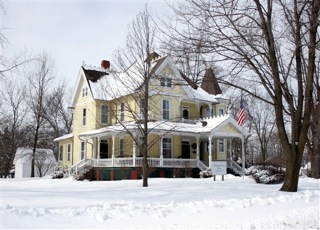 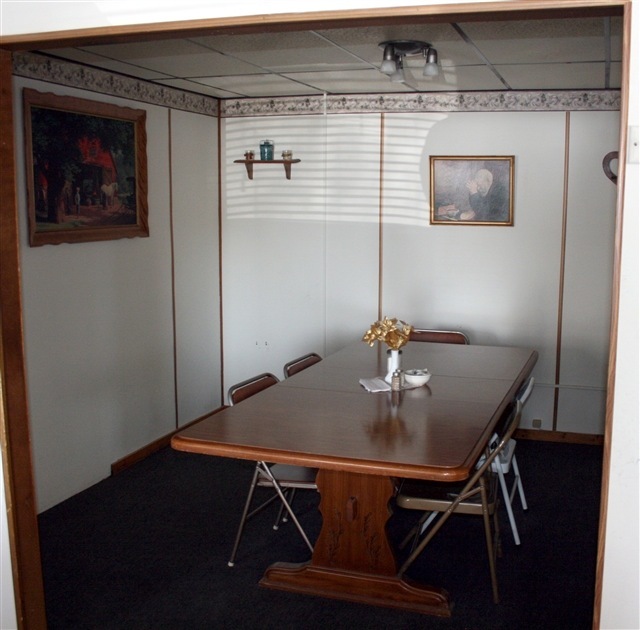 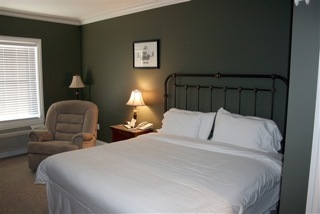 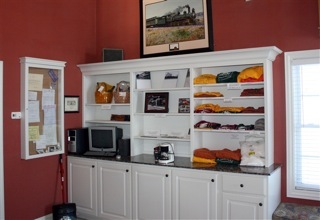 As seen in the photos, the Depot Inn rooms are spacious and very comfortable. 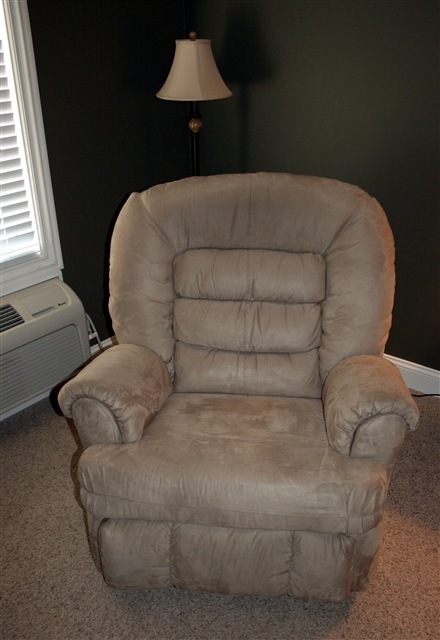 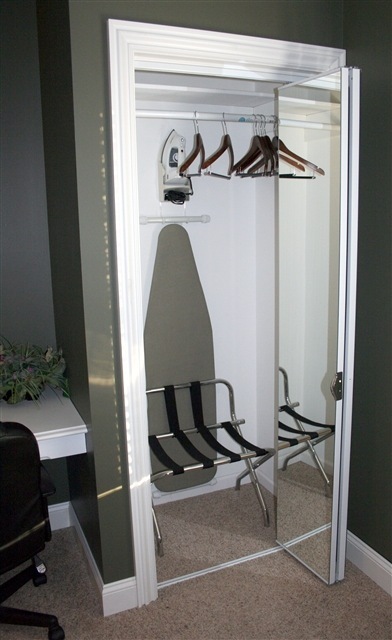 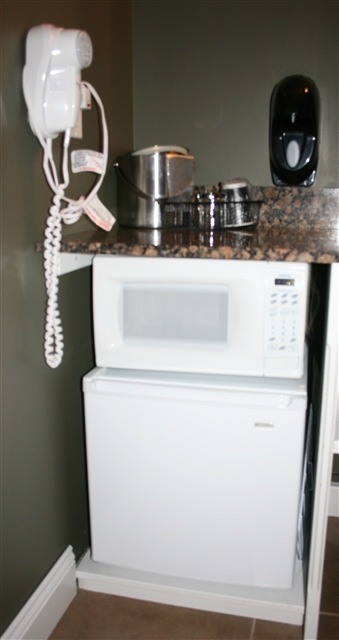 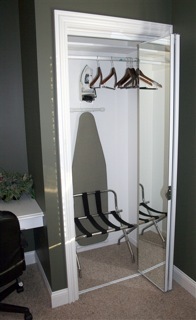 There are many extra amenities such as a luxurious recliner chair, iron and ironing board, microwave oven, room refrigerator, coffee pot and no need to pack a hair dryer with one on the wall. 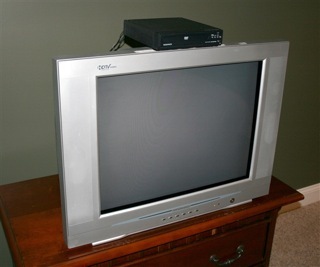 Also, the TV is a 27” flat screen with DVD player. 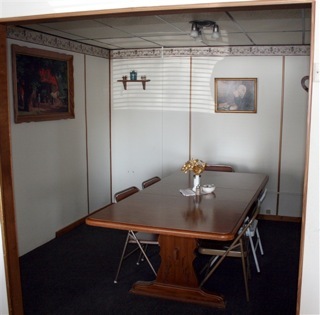 Amazing when one considers that this is a regular room, not one of the larger themed suites (Pullman, Sportsman, Victorian and Western). 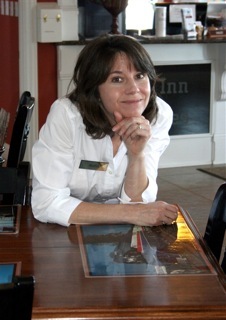 Later at the front desk, which resembles an old-time railroad ticket counter, I spoke with hotel manager Maria Snodgrass. 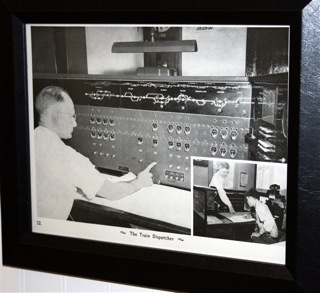 She told me that local men were coming to move the large train dispatcher board from the hotel lobby to the Show’s Off Photography studio in town. 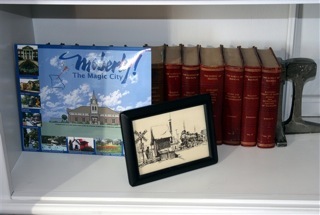 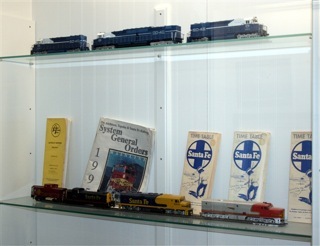 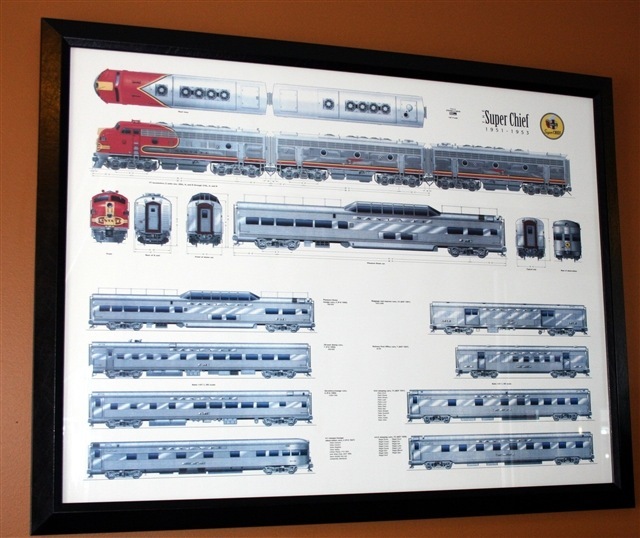 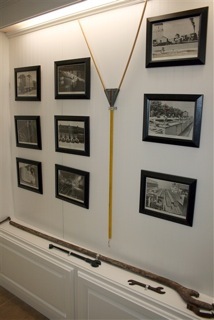 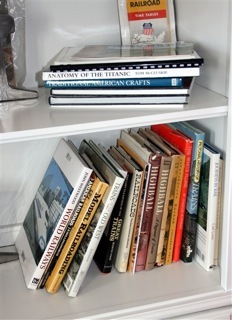 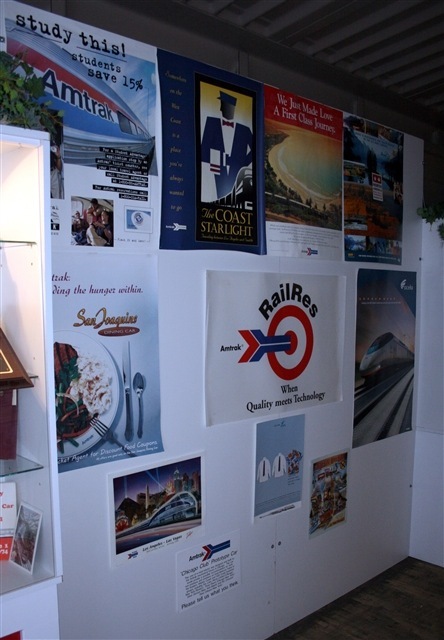 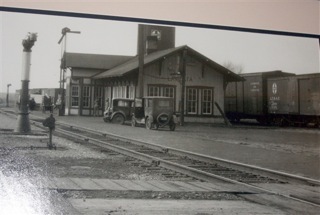 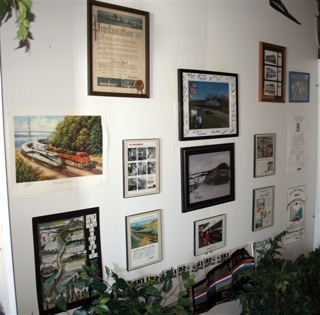 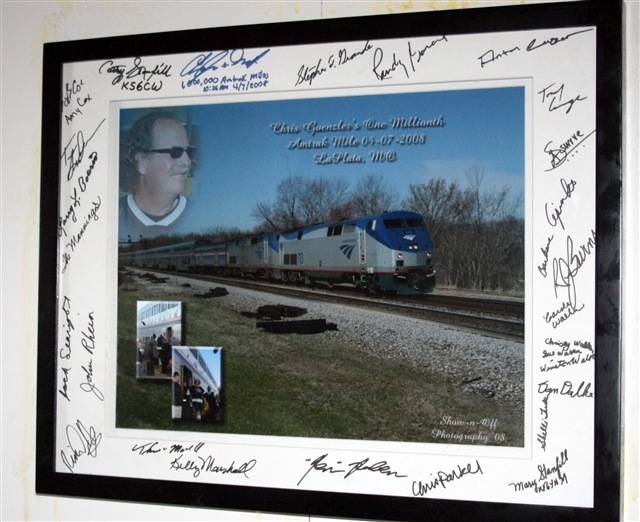 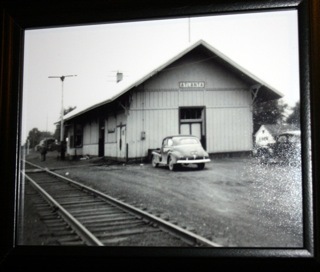 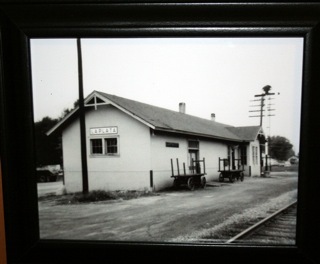 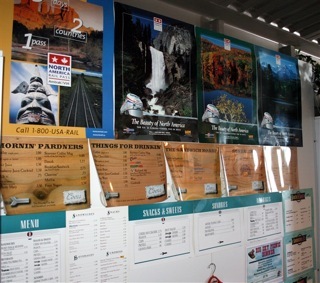 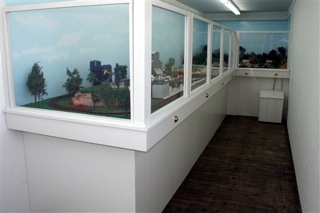 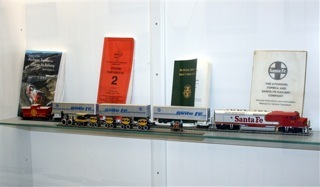 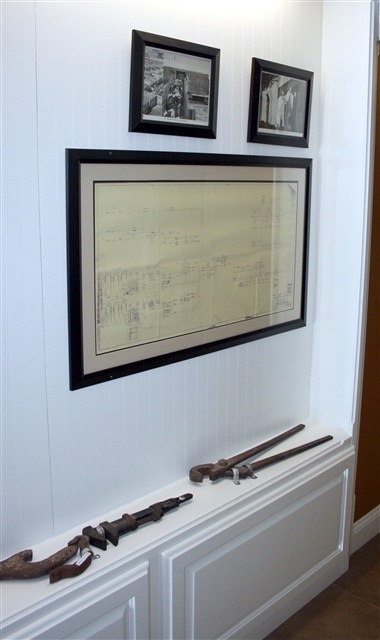 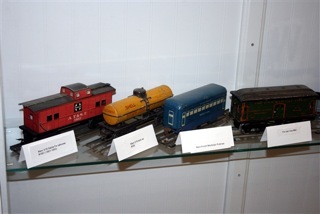 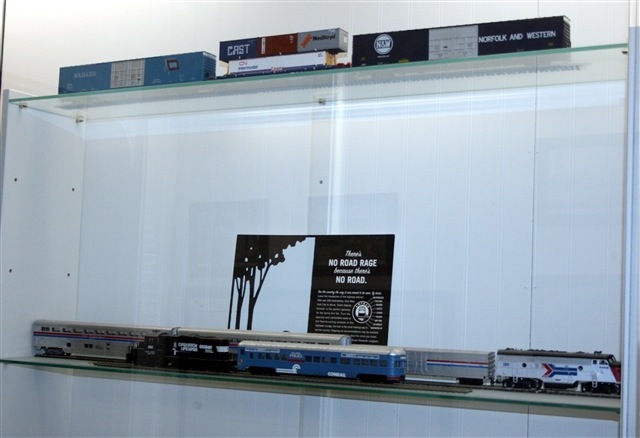 The board would become part of the Silver Rails Gallery for railroad related artwork. 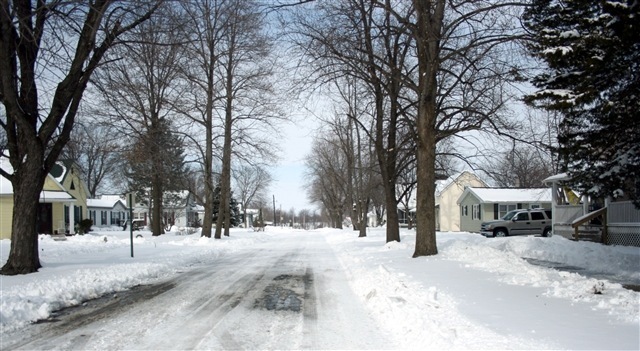 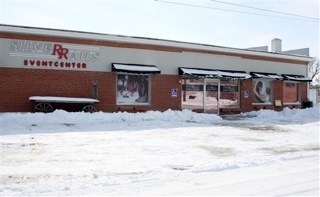 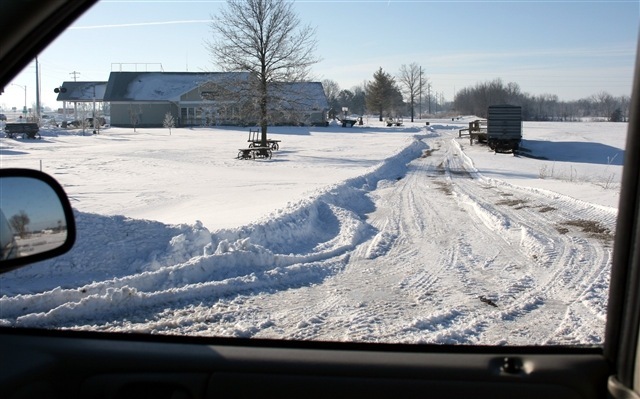 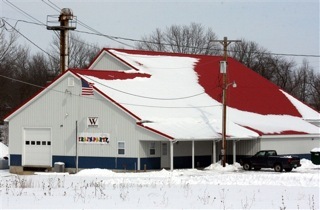 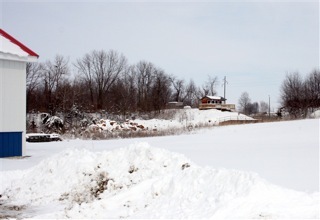 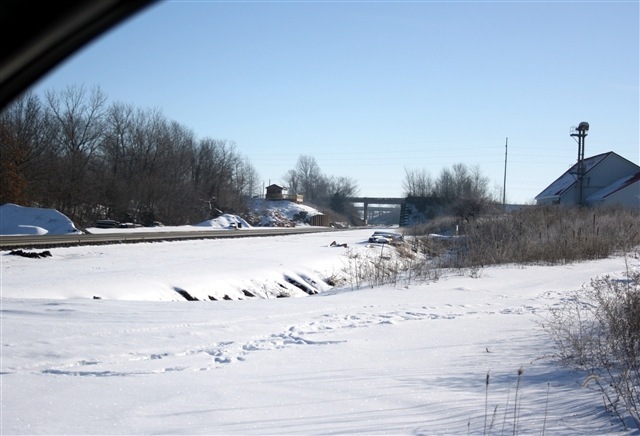 She also reported that the roads had been in the process of being plowed all morning. 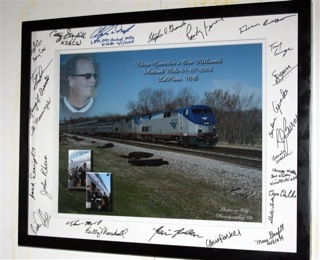 I first met Maria in 2007 when Chris Guenzler achieved his million miles by rail milestone. 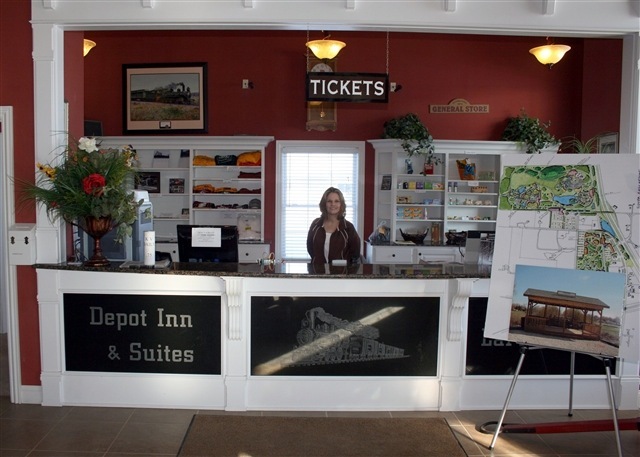 I am always impressed with her professionalism in performing the manager’s position by keeping the Depot Inn a clean, friendly and comfortable place to stay. 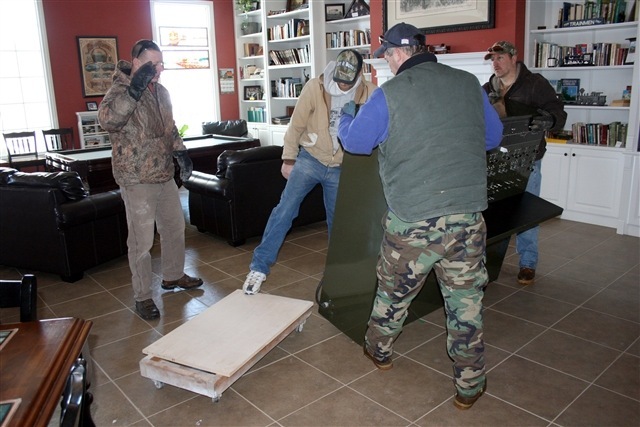 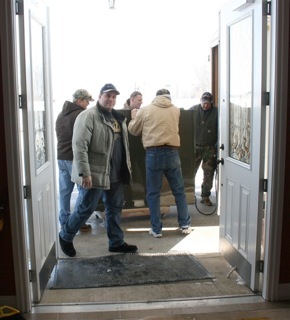 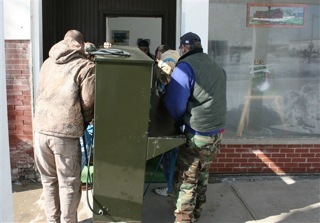 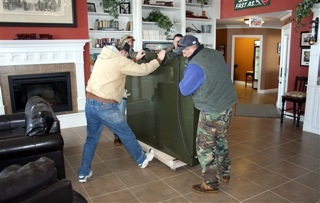 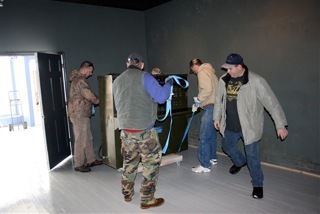 The moving crew arrived about noon and went right to work. 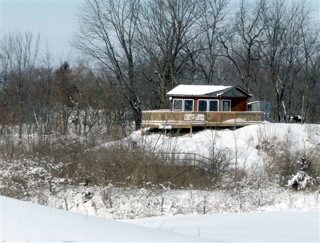 and over the bridge, where I grabbed a quick shot of the still inaccessible Lookout. 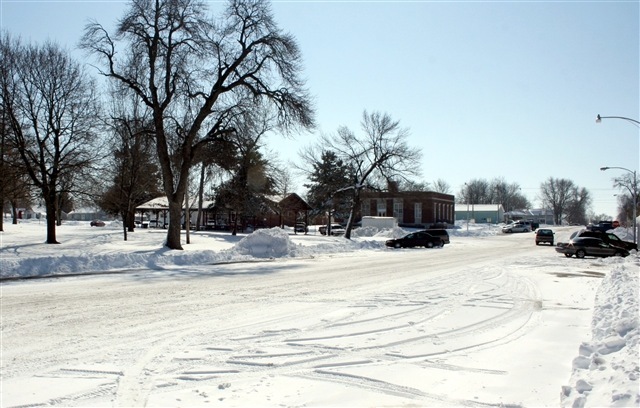 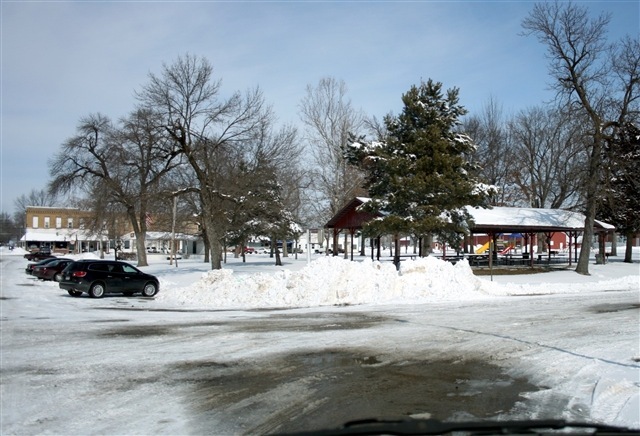 In the town square, Bob parked the car and we crunched snow crossing to 109 S. Gex St. 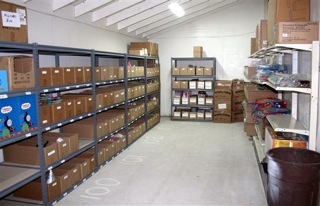 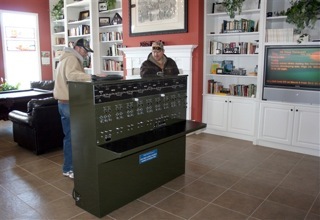 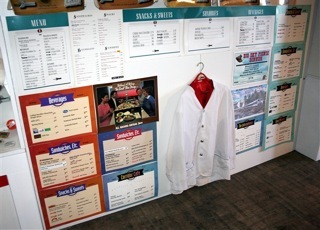 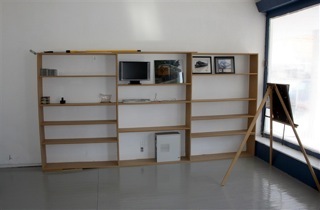 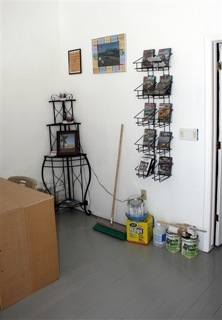 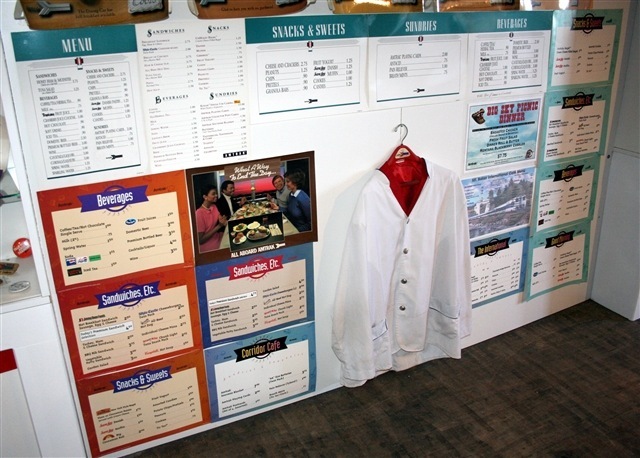 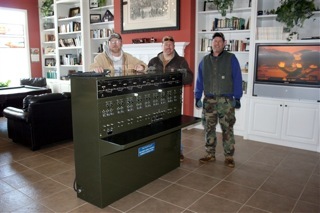 The newly painted interior of Silver Rails Gallery awaited the arrival of the dispatcher board. 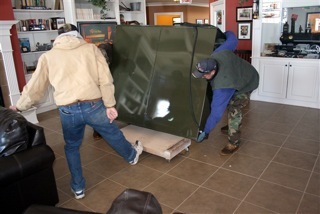 The team grabbed hold and through the door it went. Show’n Off Photography is co-owned by Bob Cox and his wife Amy. 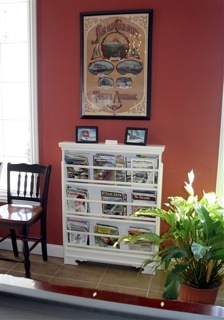 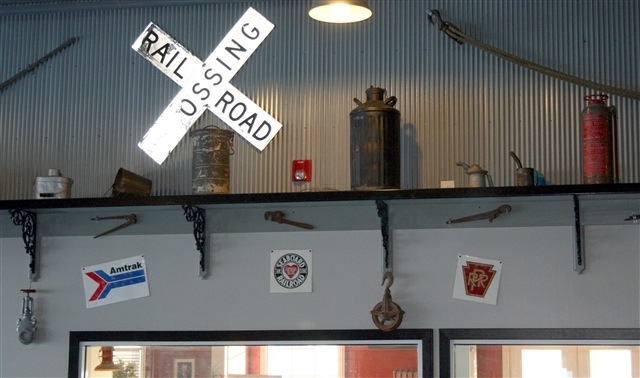 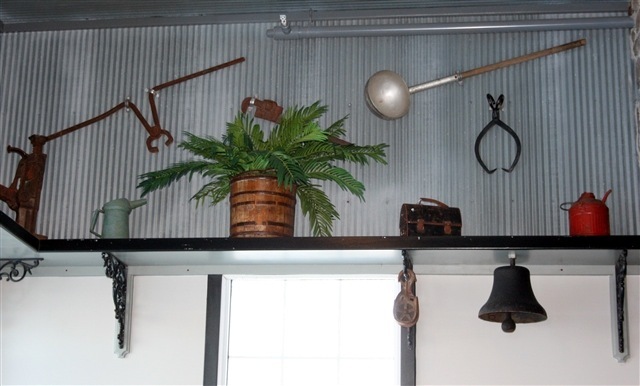 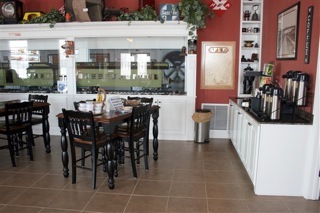 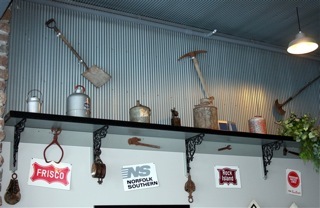 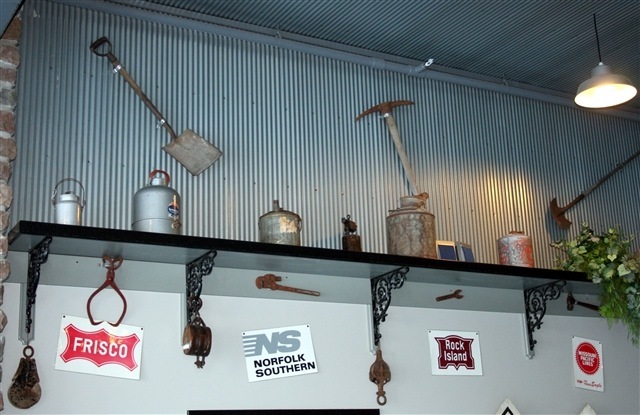 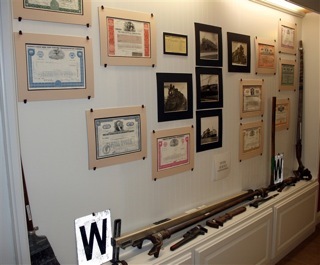 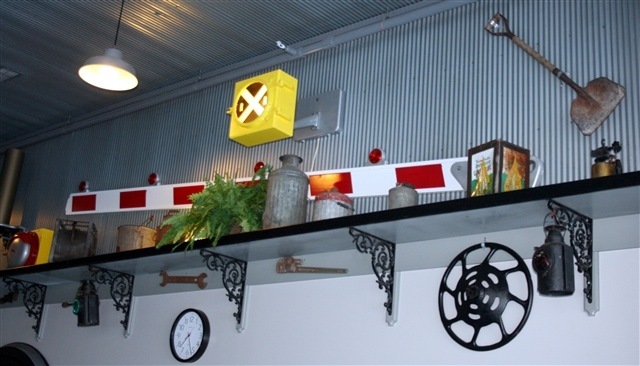 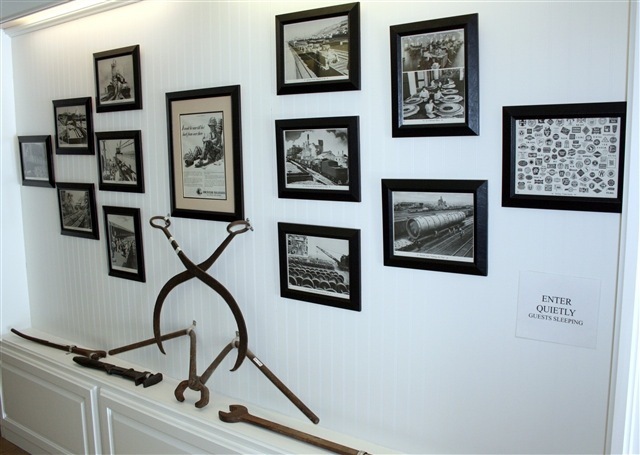 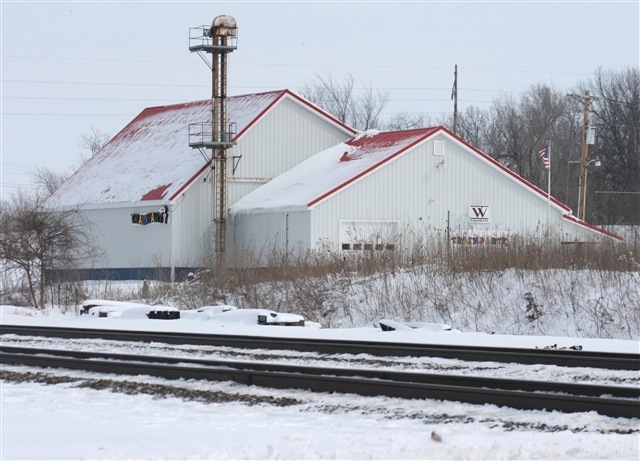 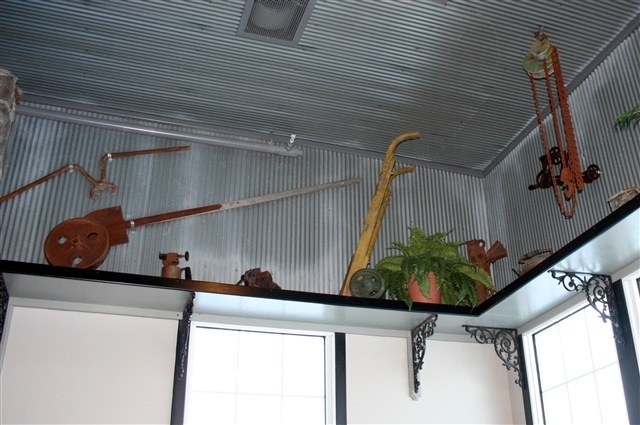 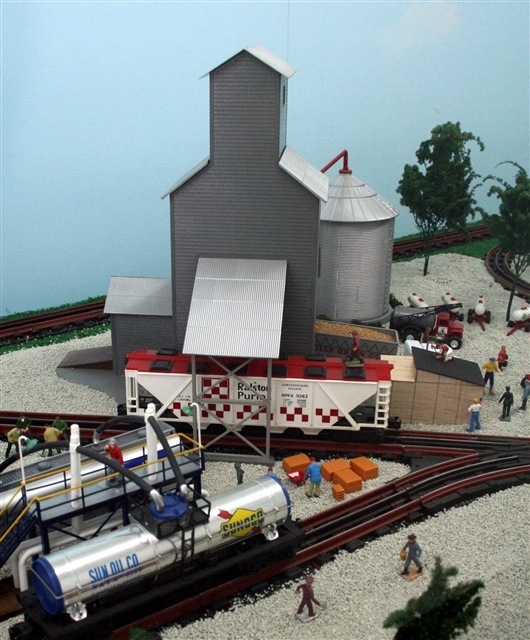 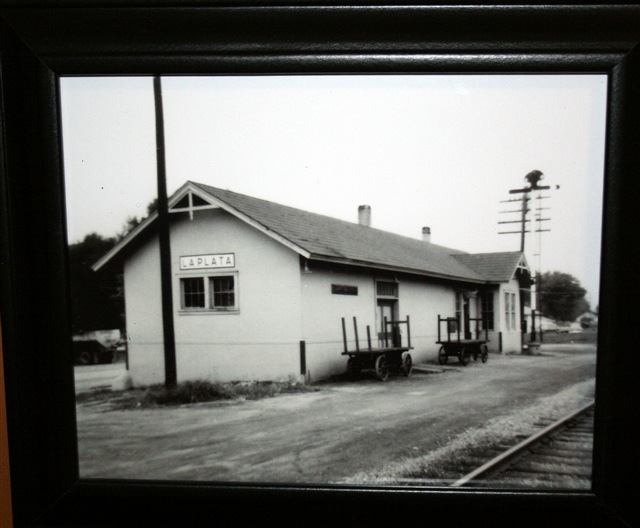 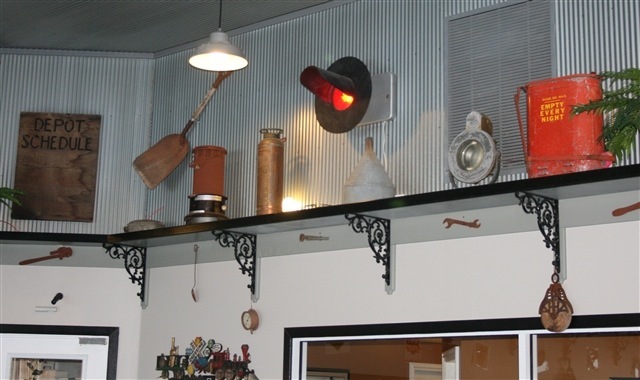 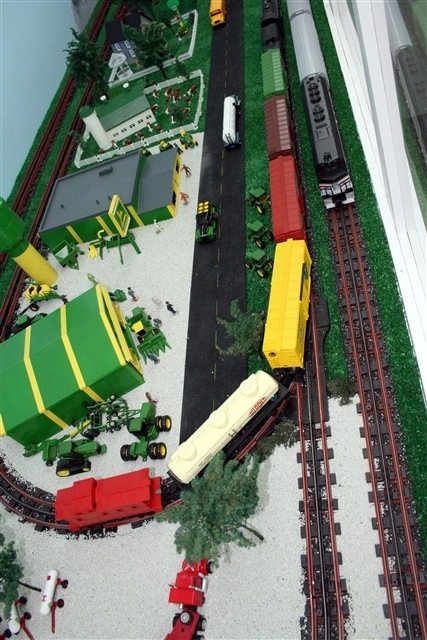 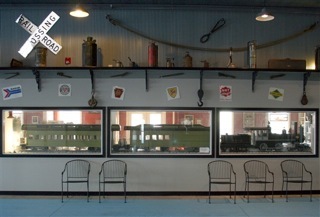 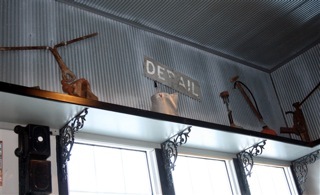 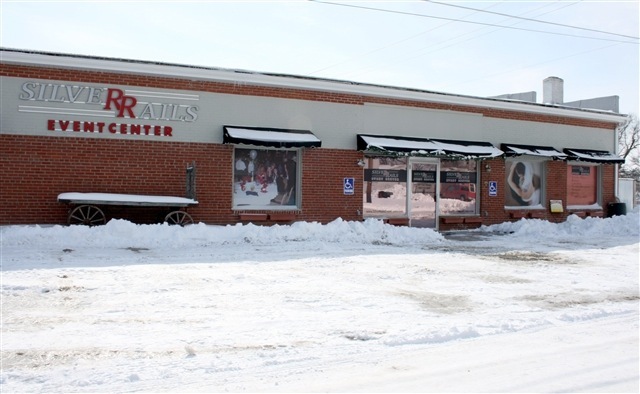 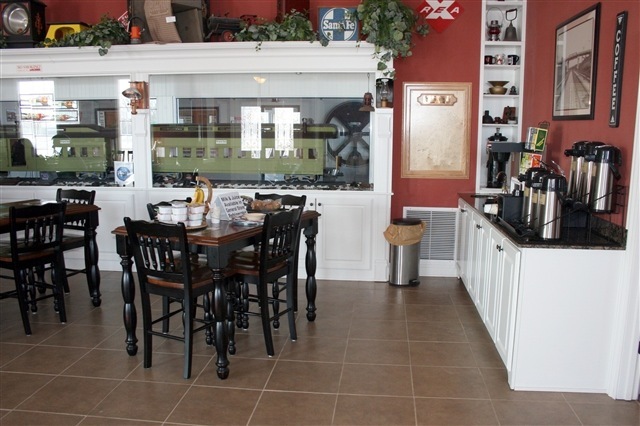 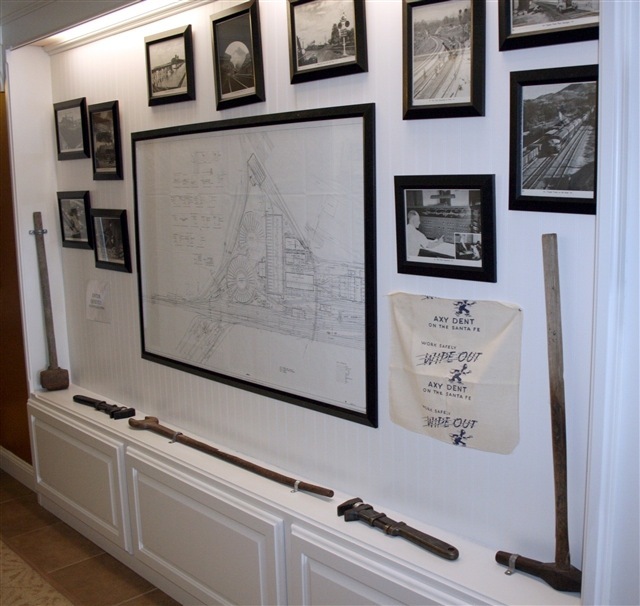 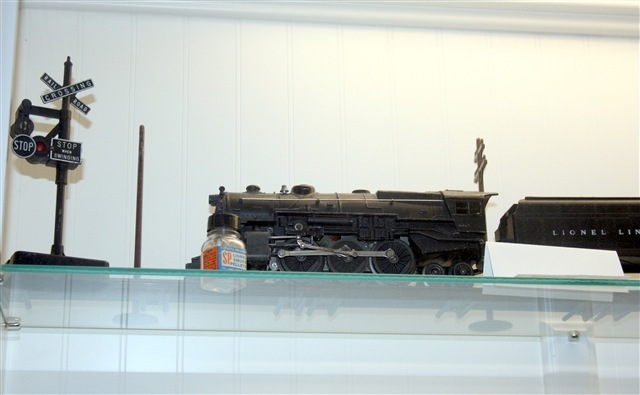 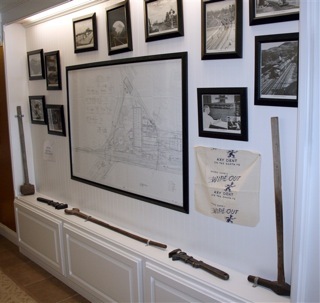 The Silver Rails Gallery, set for a March 13th grand opening, is housed in their studio to exhibit artistic interpretations of all things railroad related, such as railroad photography, paintings, railroad wood carvings, travel poetry, CAD train renderings and more. 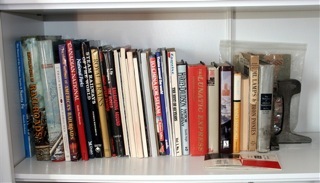 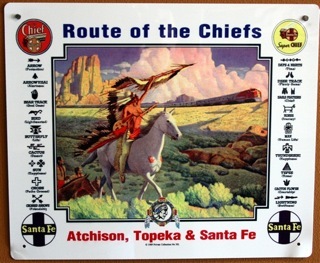 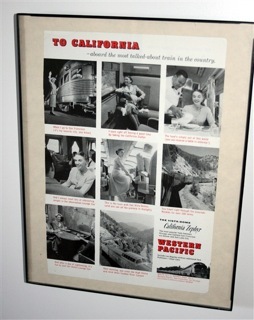 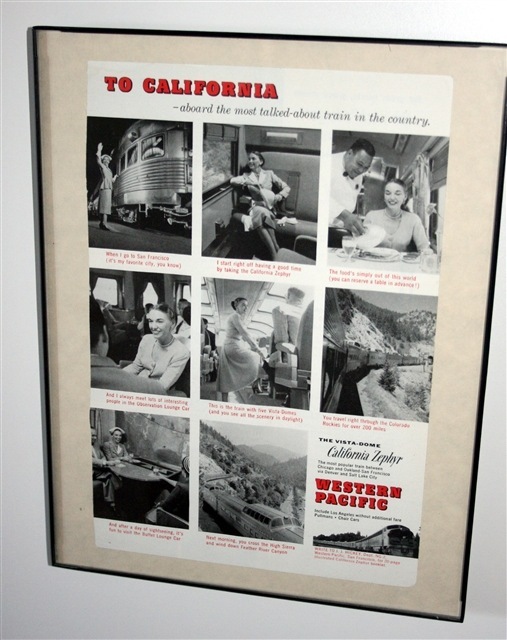 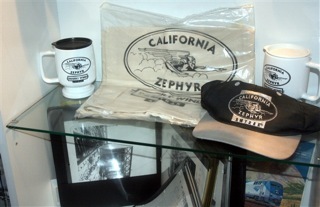 By the time this travelogue is posted on TrainWeb.com, the opening will have been reported upon by Carl Morrison. 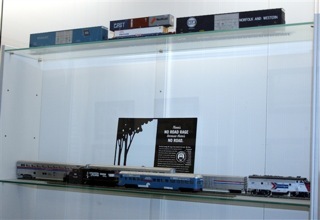 Click here to read it: (http://trainweb.org/carl/SilverRailsGalleryOpening/Gallery/). 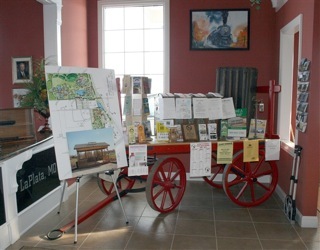 Directly across from the Gallery is a picturesque park forming a town square. 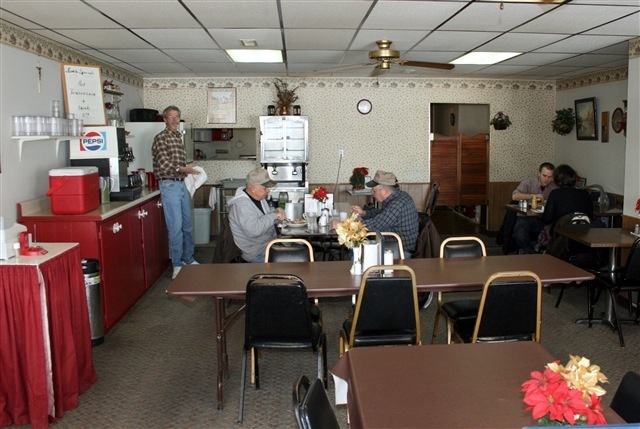 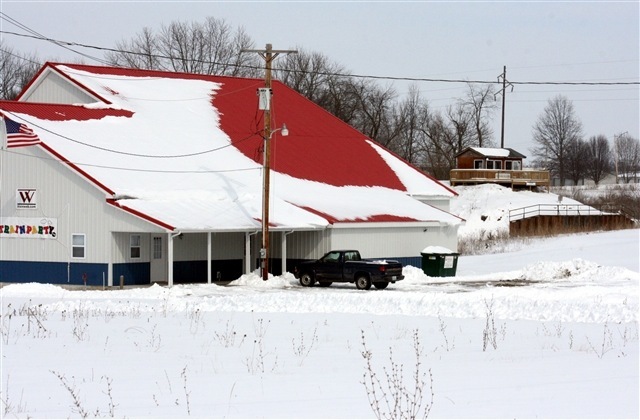 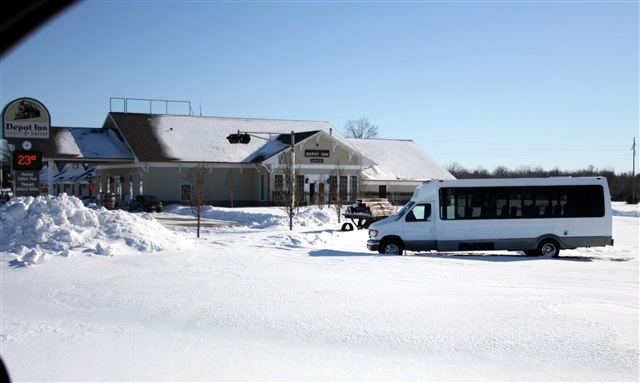 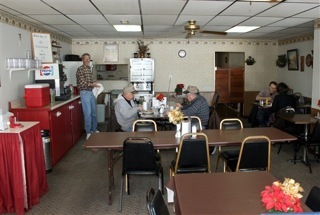 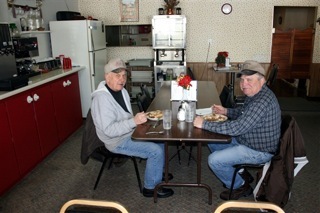 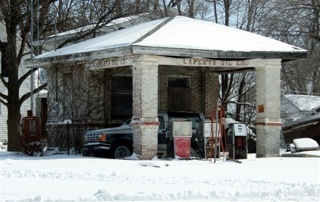 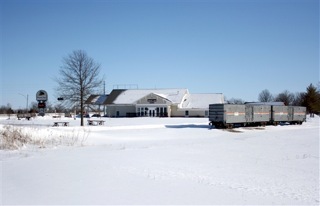 Afterward, Bob drove to the Depot Inn where I was able to get a vehicle to use. 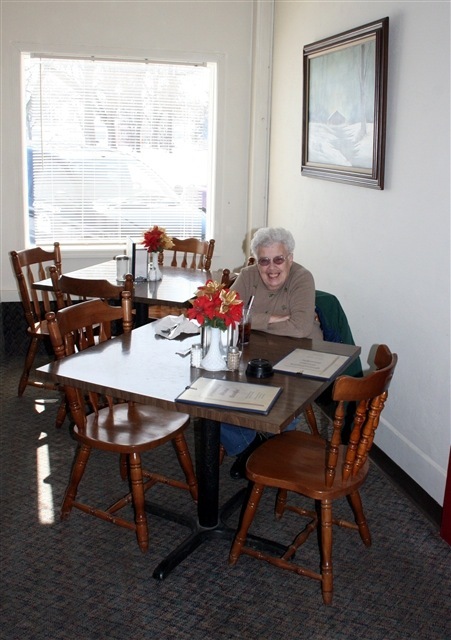 It was lunch time; therefore, a trip back into town to visit Grandma’s Restaurant was in order. This is the place for home cookin’ and the food was delicious. 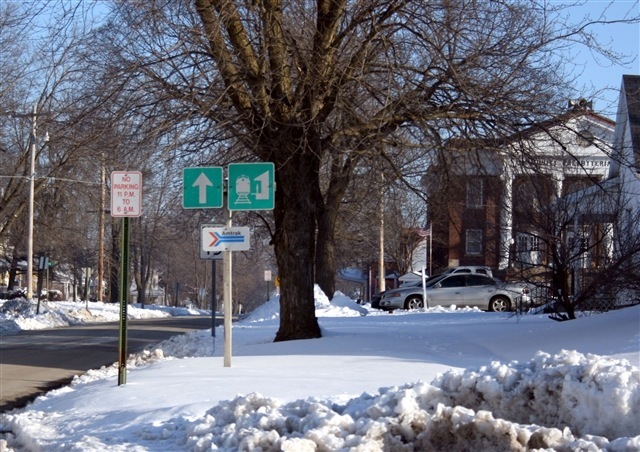 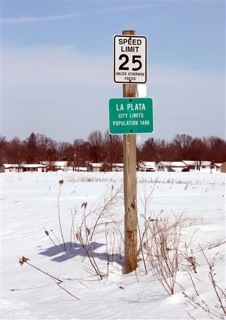 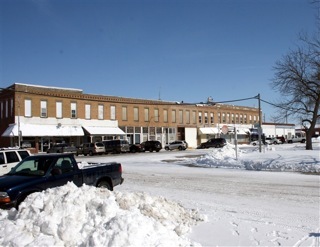 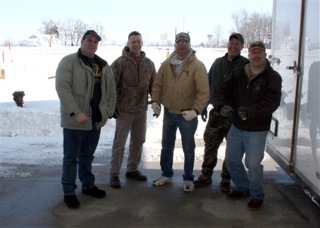 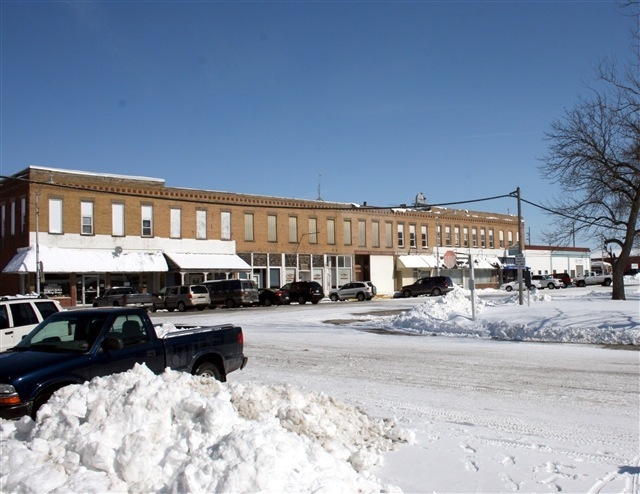 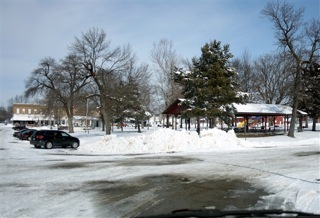 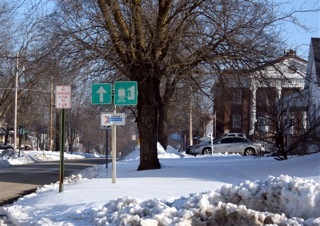 Following lunch, a trip around town demonstrated that La Plata had handled the snow removal well. 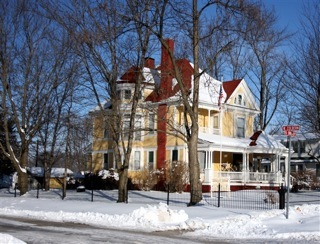 Two architecturally interesting houses in La Plata are Queen Anne Victorians Gilbreath McLorn (built 1896) and the Doneghy house (built 1895). 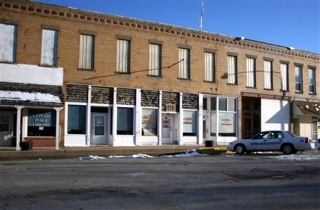 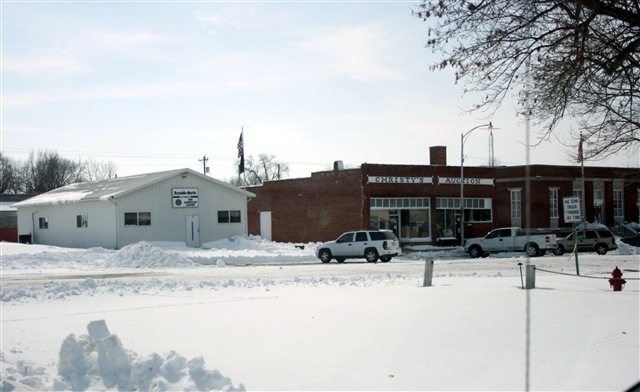 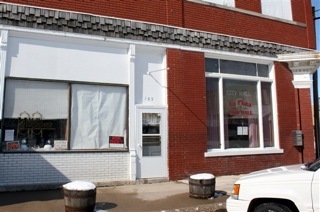 Both are on the National Register of Historic Places. 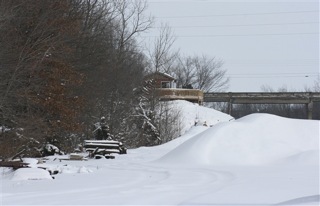 On Brown Street again, a quick stop at the bridge provided a couple more photos of the Lookout before arriving again at the Depot Inn. After a bit of a rest, I decided to make a run to the Train Party building. 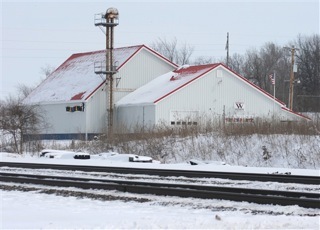 It sits across the tracks from the Lookout and Amtrak station. 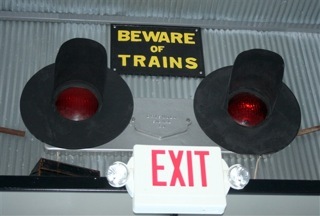 Stepping through Train Party’s front portal, Bob Cox was hard at work. 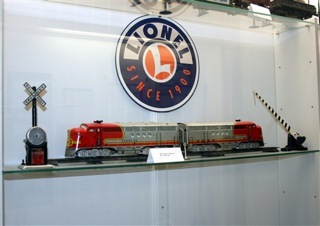 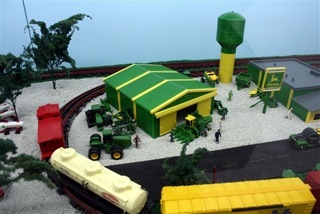 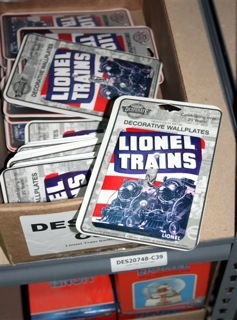 I told Bob that I wanted to get a few photos of products offered by Train Party. 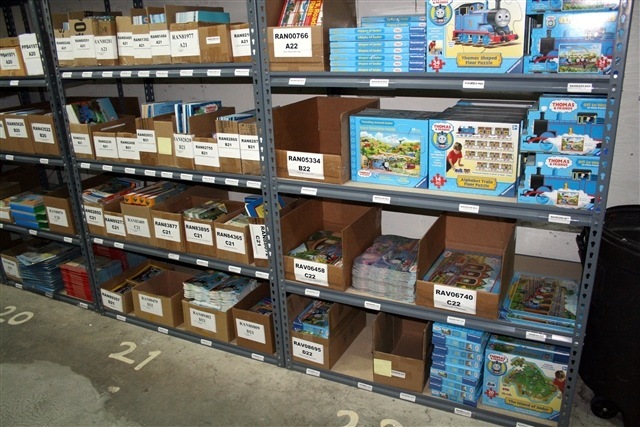 There were so many products that, for a moment, I didn’t know where to start. 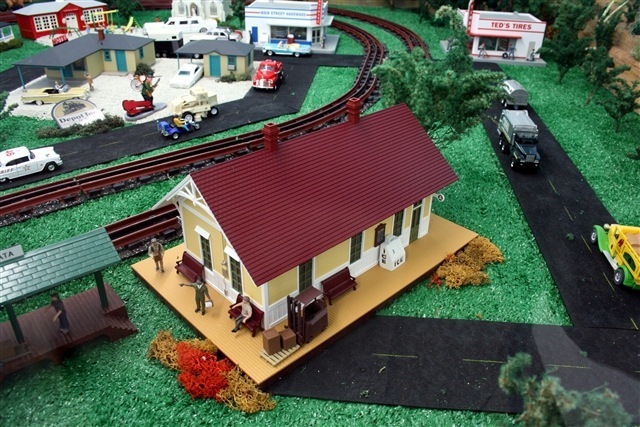 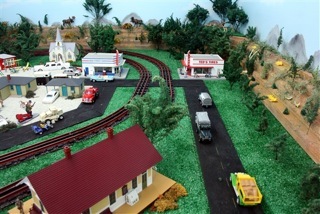 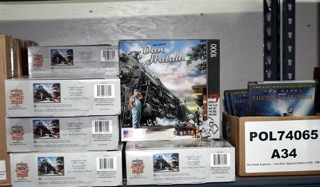 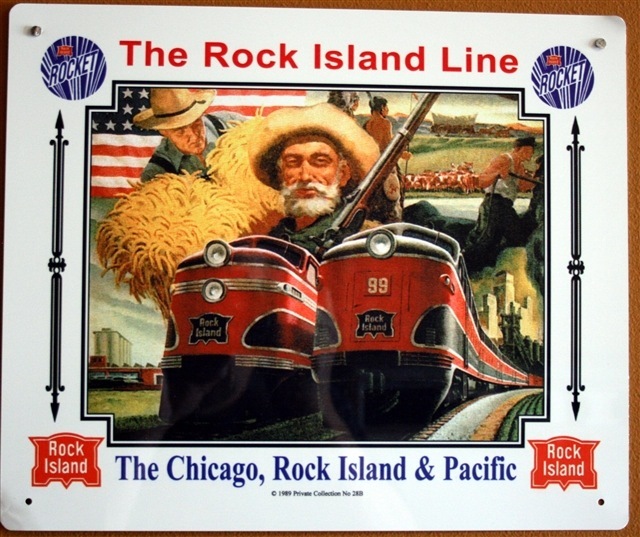 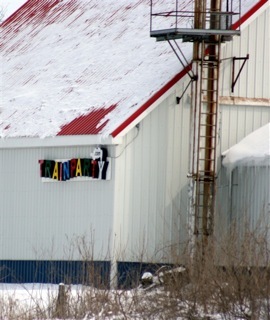 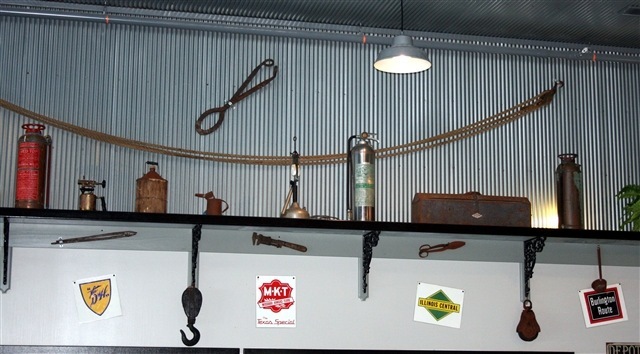 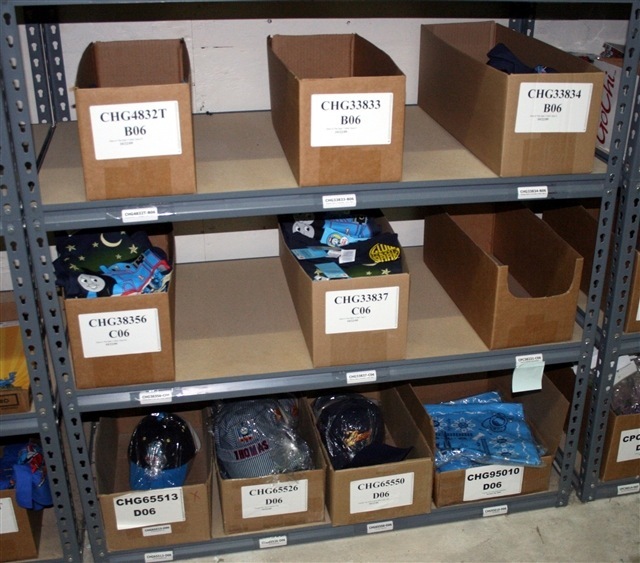 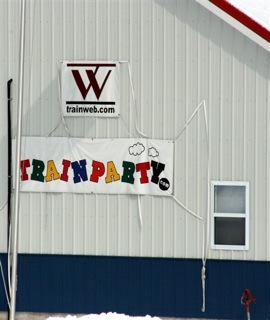 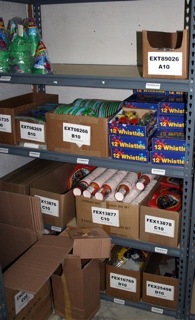 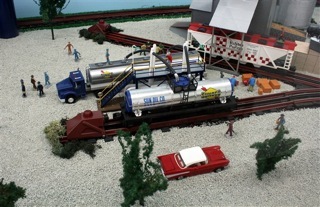 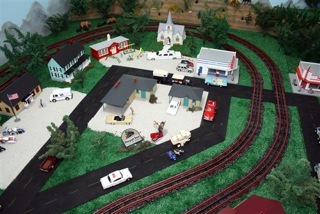 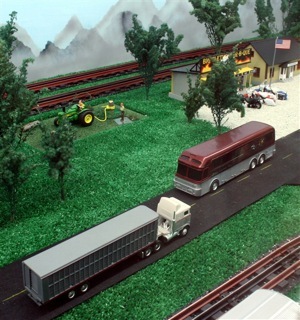 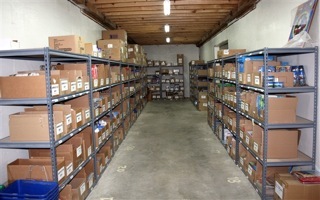 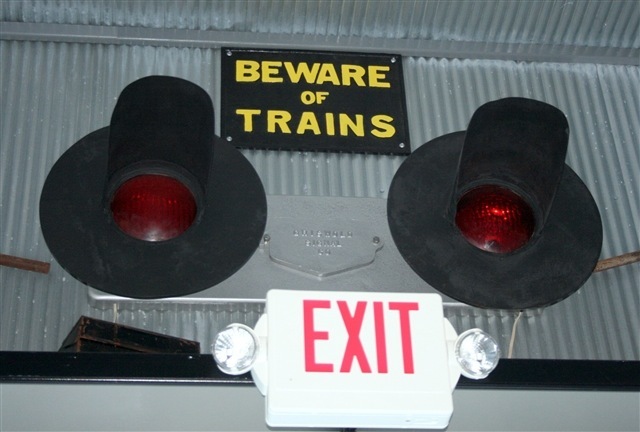 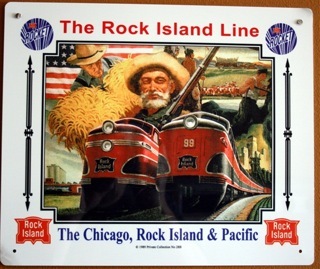 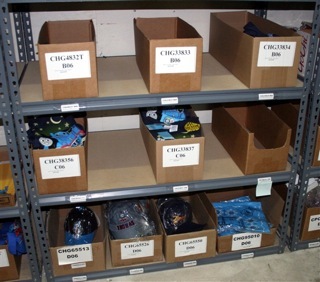 Train Party is a railroad related business that offers items for - well, as the name implies – train parties. 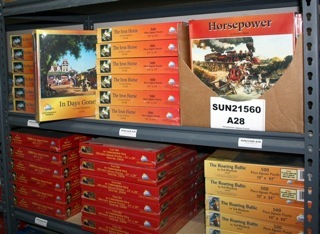 I believe they sell via the Internet and catalog sales. 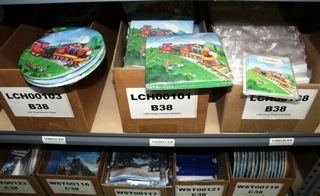 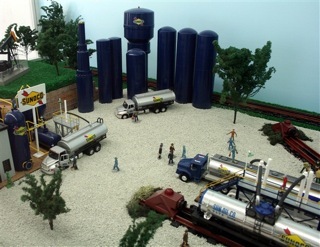 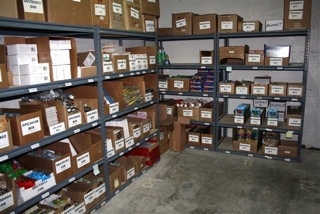 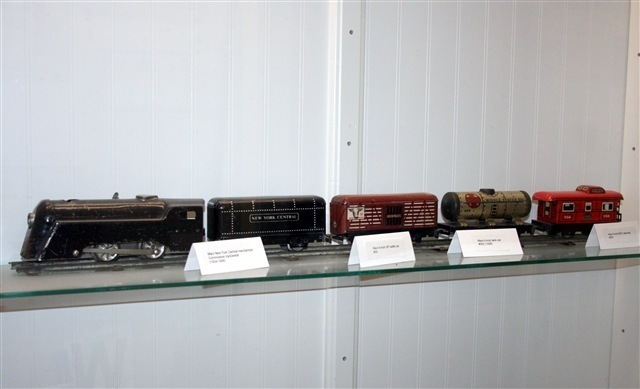 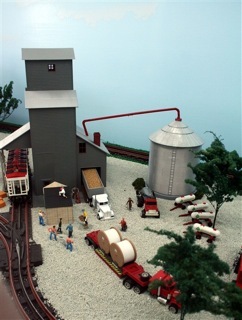 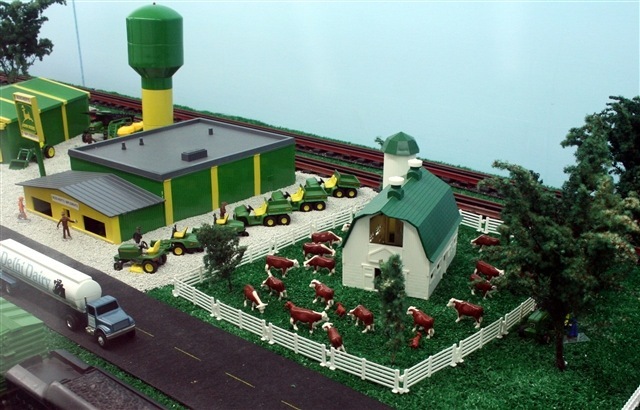 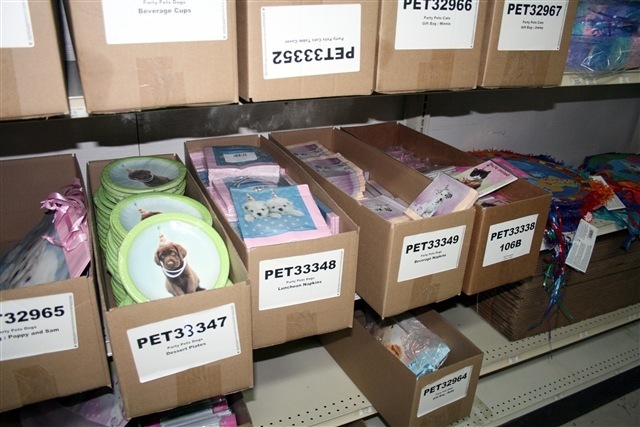 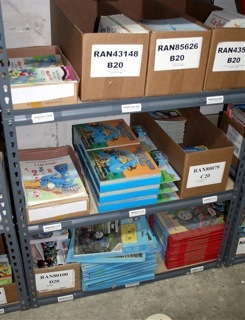 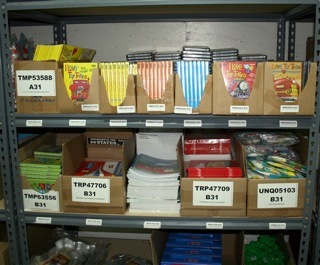 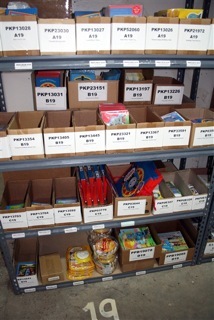 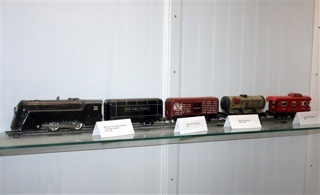 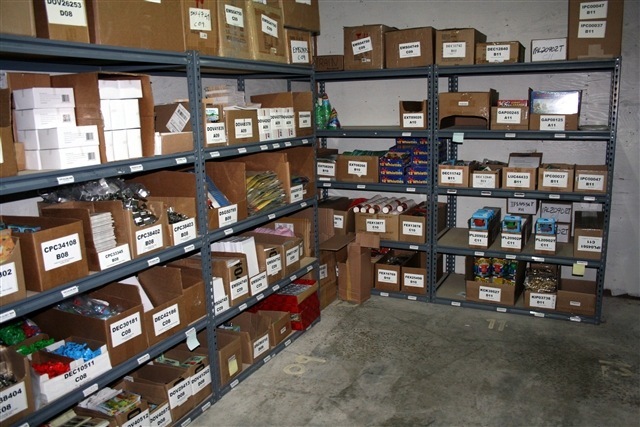 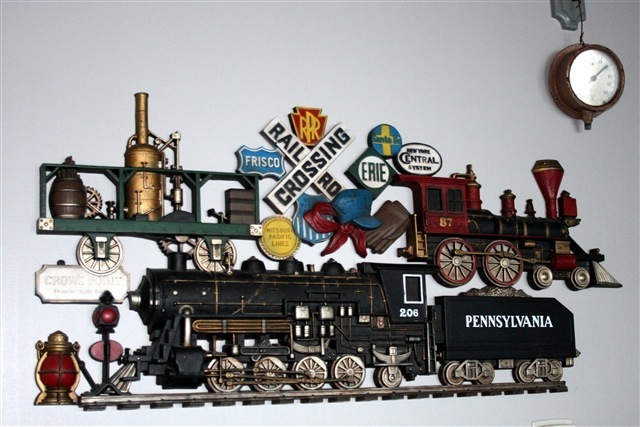 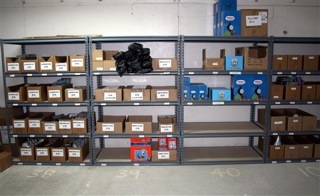 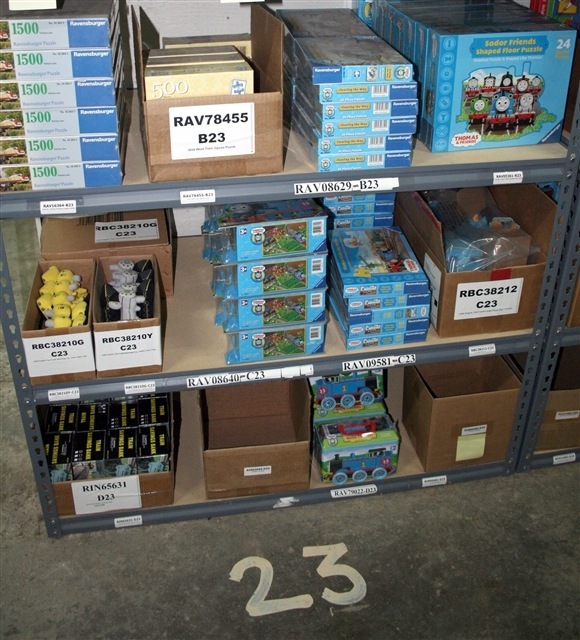 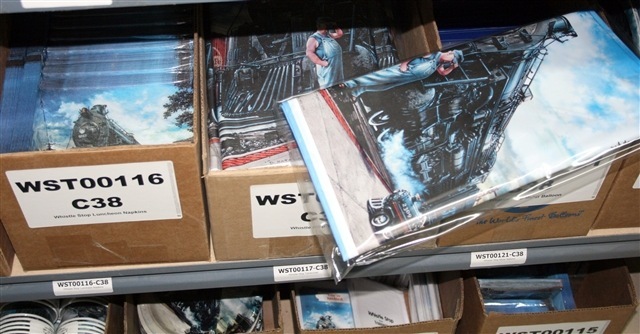 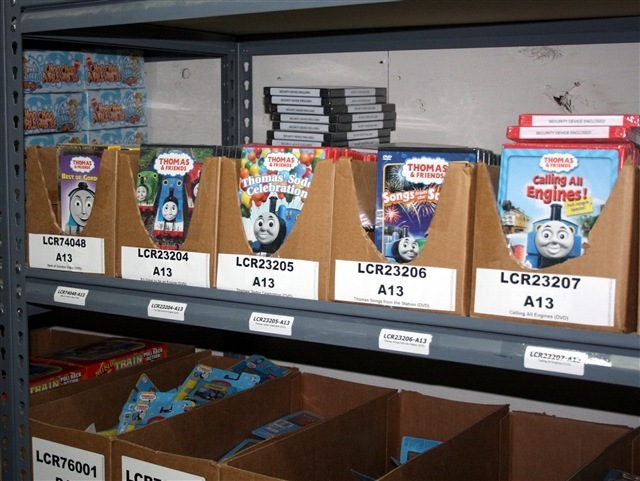 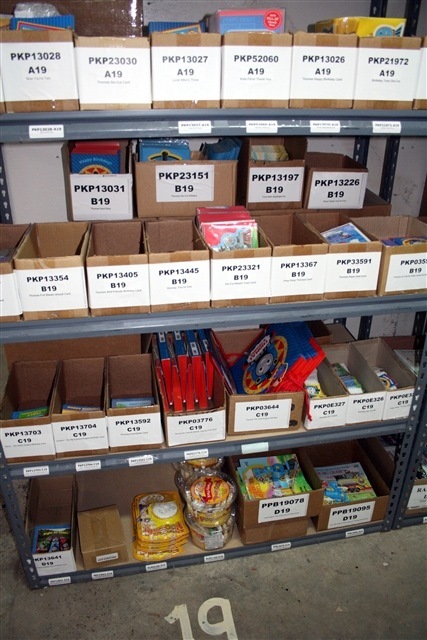 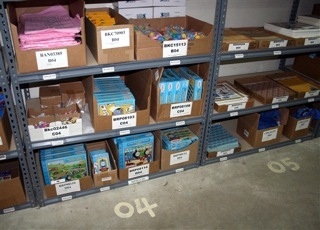 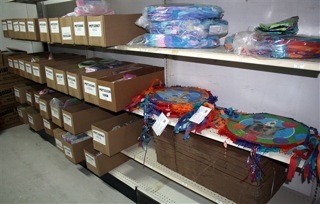 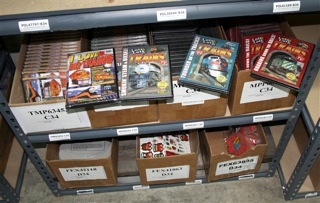 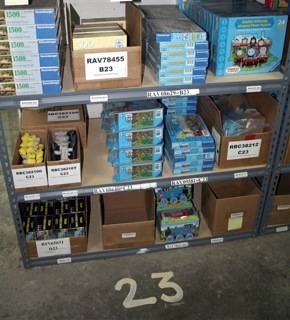 Most of their products are train themed, including party favors, plates, toys, piñatas, puzzles, balloons, costumes, hats, cake pans, DVDs, and much more from Thomas the Tank Engine to classic steam. 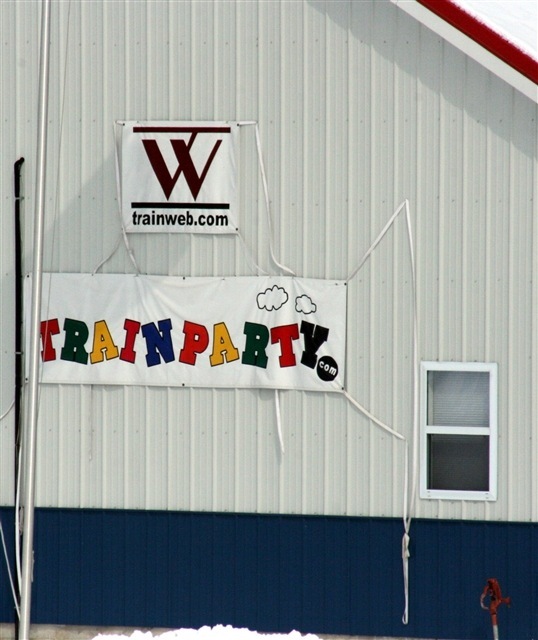 If you want to learn more about this unique business click here: http://www.trainparty.com/. After a tasteful visit to the Red Rooster Restaurant for dinner, I returned to the Depot Inn next door. 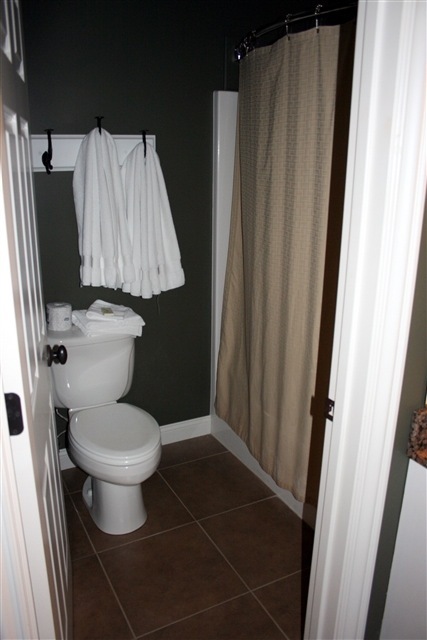 It may seem a small thing, but to the traveler at the end of day, the restorative power of a hot shower and a clean, restful room can’t be overstated. 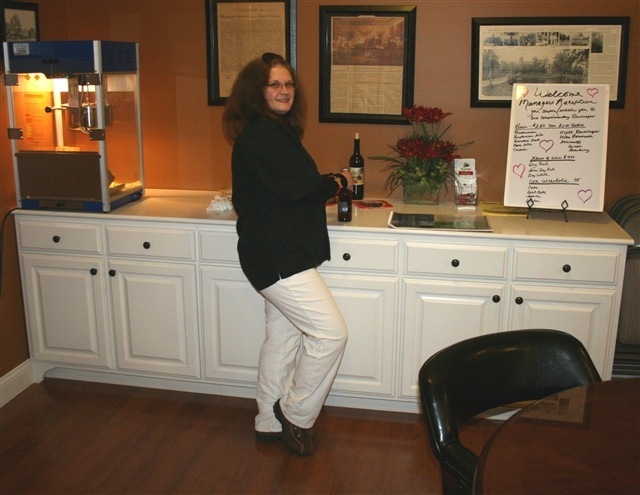 About seven-thirty there was a Manager’s Welcome reception in the meeting room. They offer a complimentary drink or two of wine from local vineyards, beer or a soft drink, and popcorn. 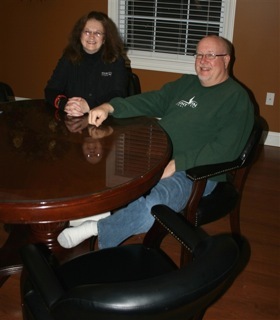 That night, Shelli Tucker was the hostess and I met another guest named Dan. 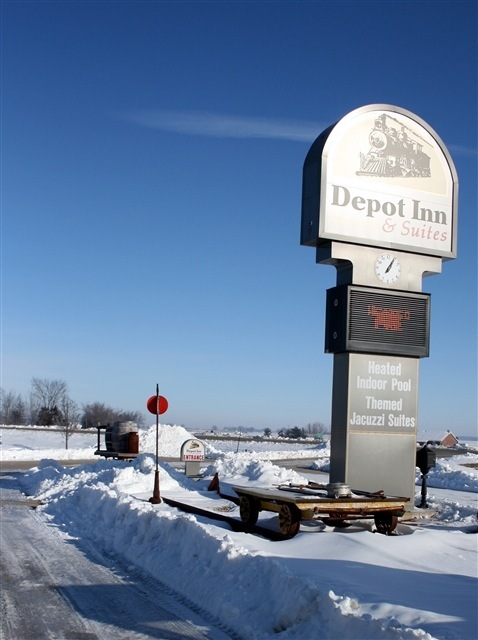 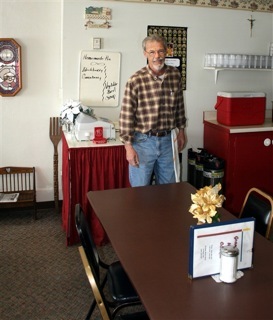 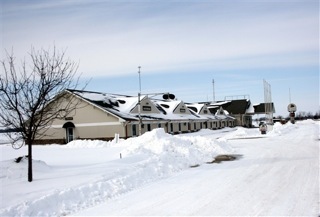 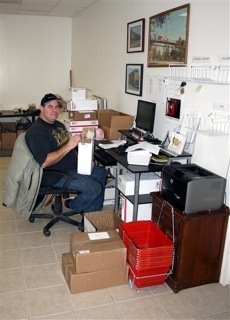 Dan travels from Indiana on business every month and always stays at the Depot Inn & Suites. Back at my room, the laptop connected easily to the hotel’s free Ethernet to check emails. 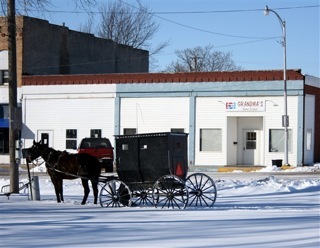 They also have free Wireless. 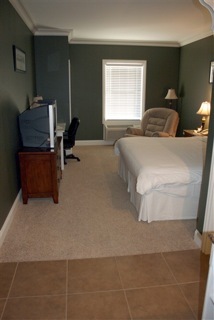 Then into that big comfortable bed for TV watching to end what turned out to be a pretty good day. 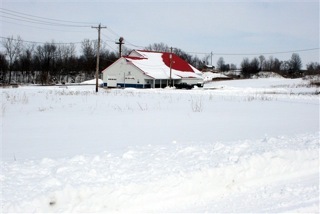 On day two I was out snapping snow photos around the Depot Inn. Take note of the interesting handcar and speeder track car #65608. Of course we have all seen movies with people pumping away to move a handcar. 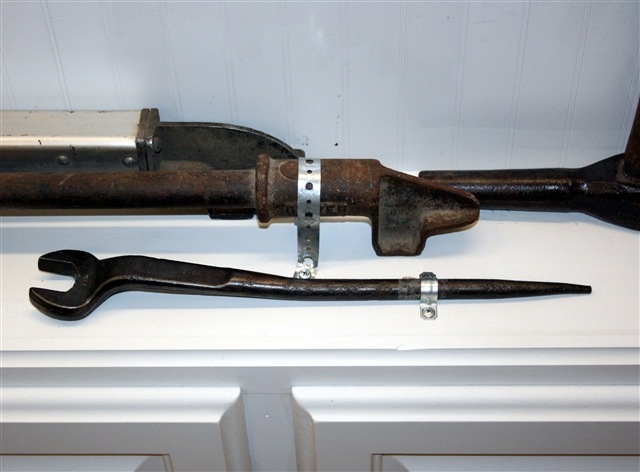 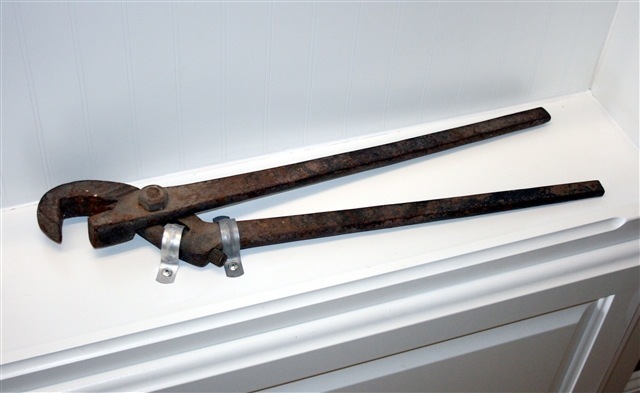 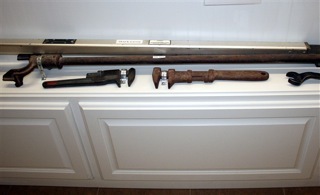 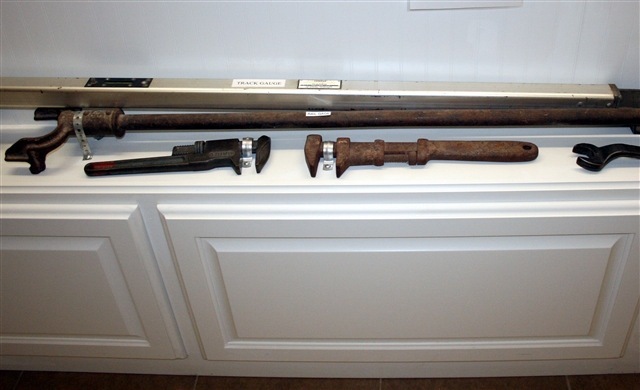 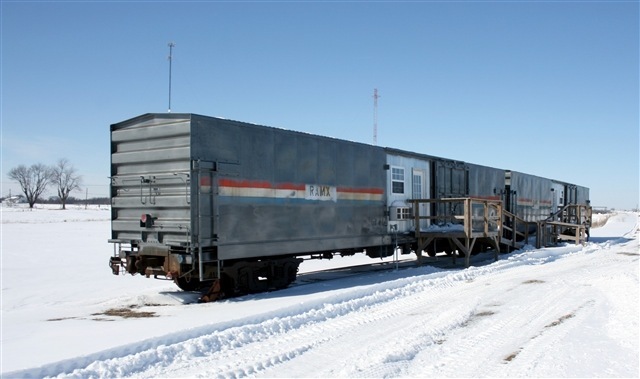 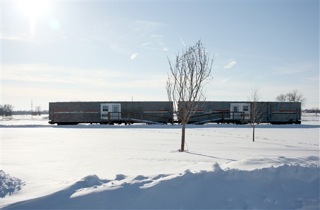 The Speeders were used mostly by railroad Maintenance of Way departments to make track inspections and move personnel before the Hi-Rail trucks came into being. 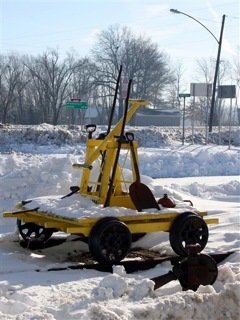 Although there were other sizes, this one appears to be a two person small engine vehicle. 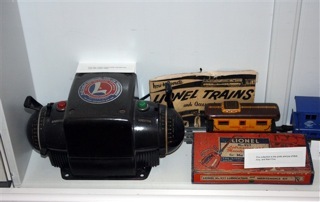 I believe there is a branch of rail fanning with an organization of people operating refurbished Speeders on organized Speeder trips. 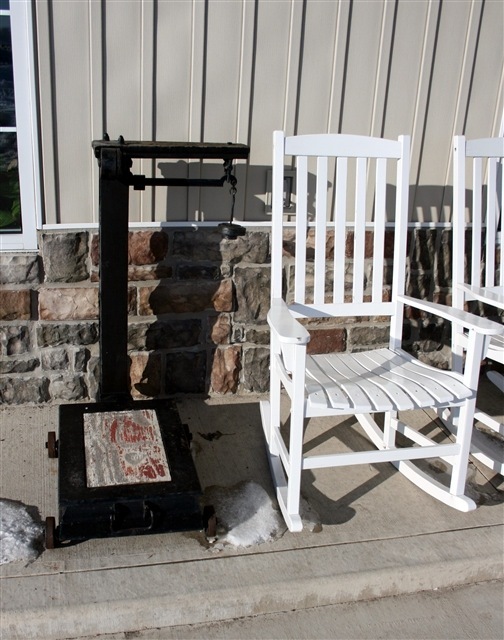 With temperatures in the teens, there were no takers for the rocking chair in front of the hotel. 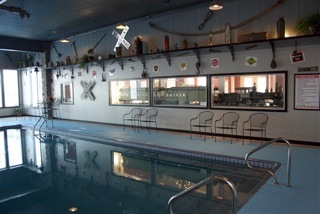 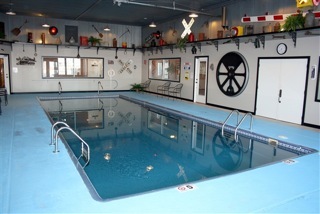 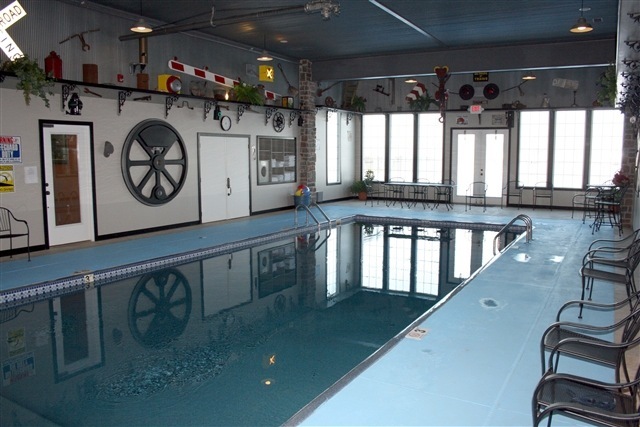 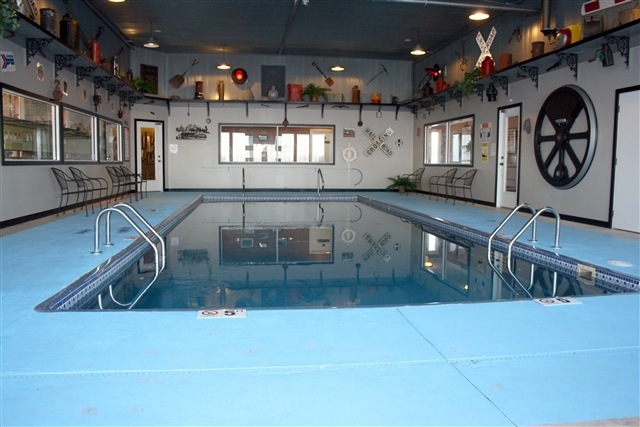 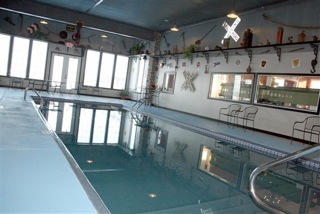 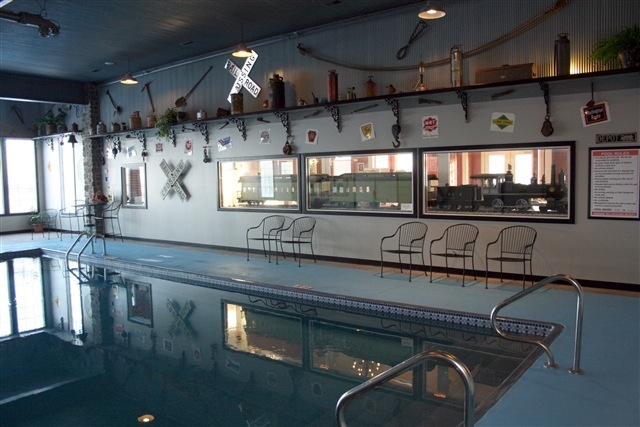 Inside the Depot Inn & Suites, is a unique heated pool area, railroad related of course. 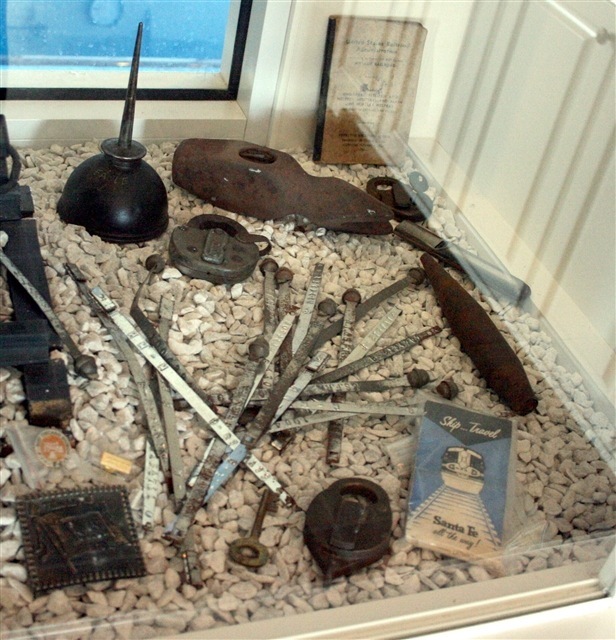 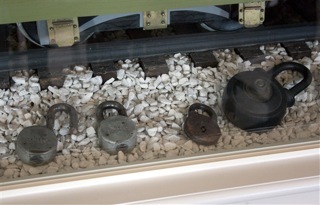 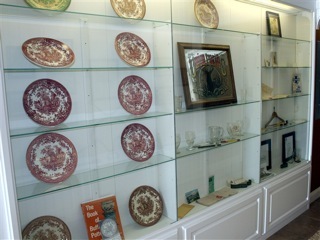 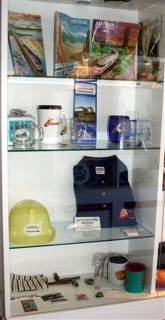 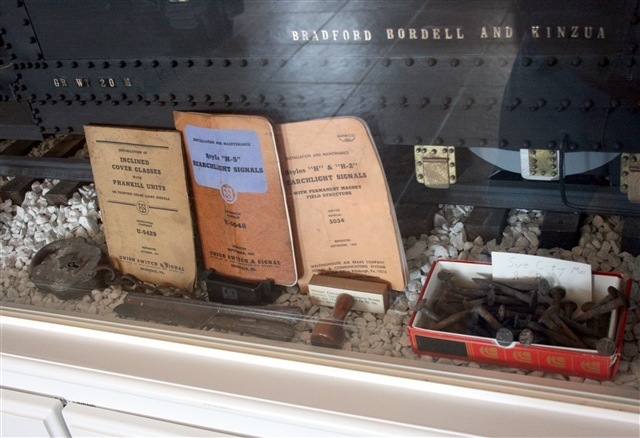 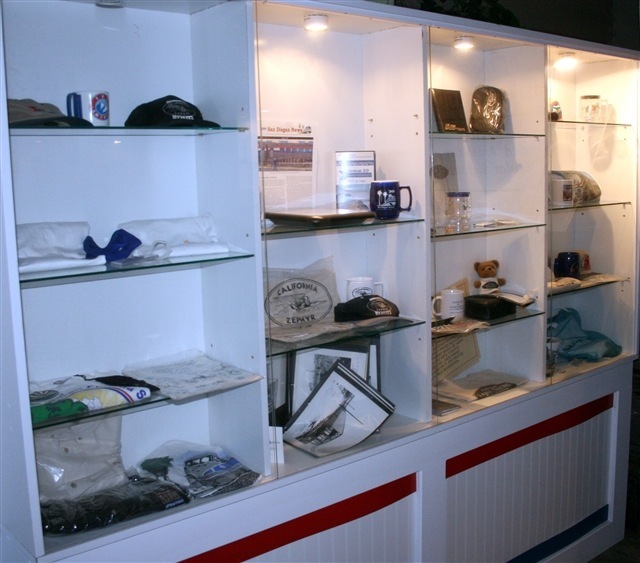 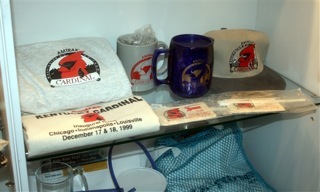 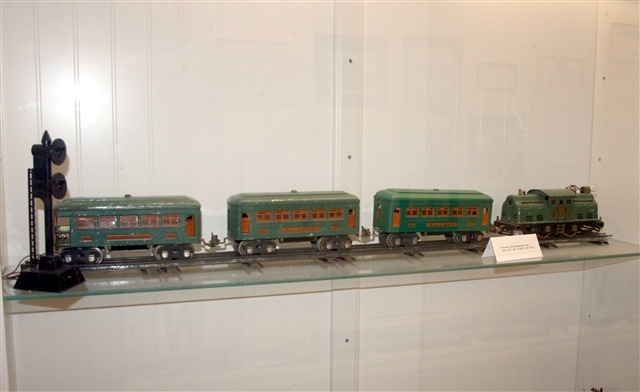 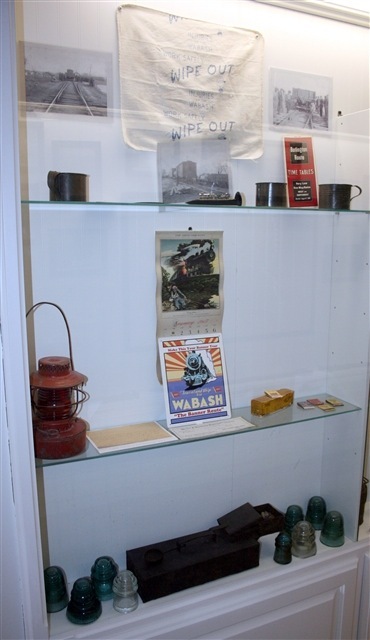 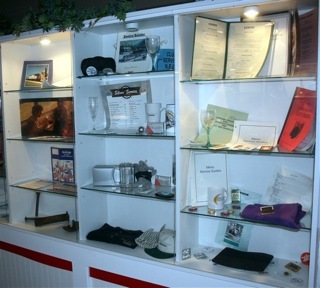 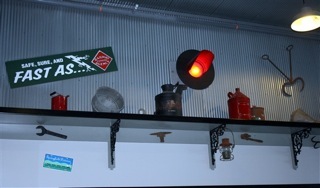 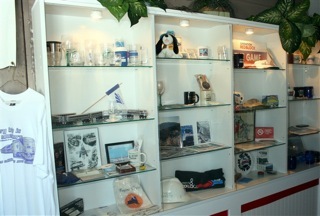 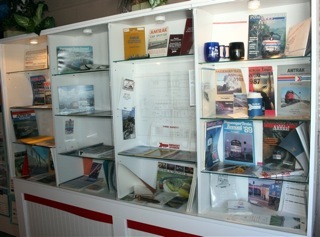 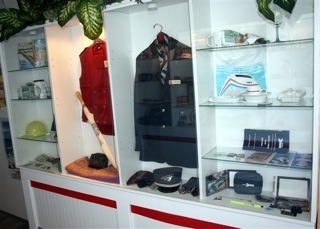 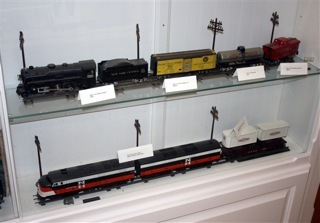 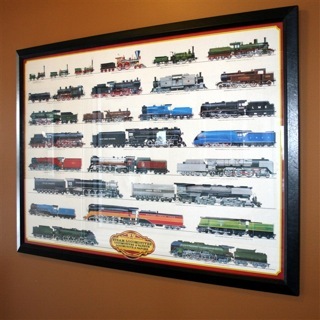 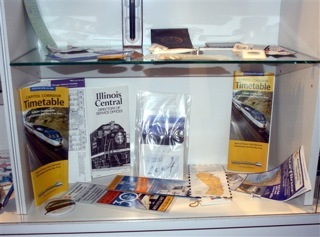 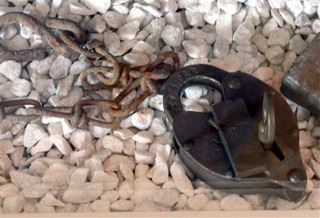 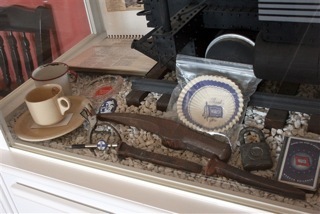 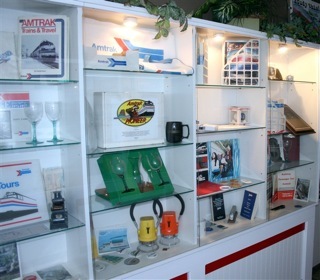 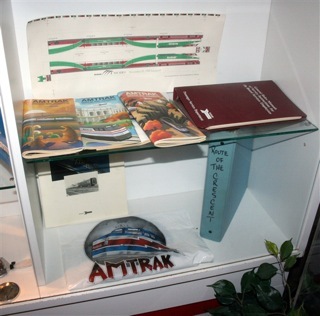 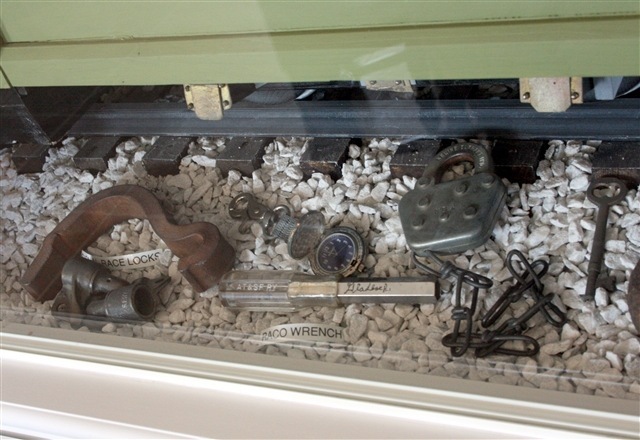 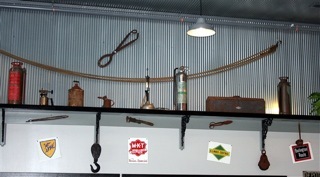 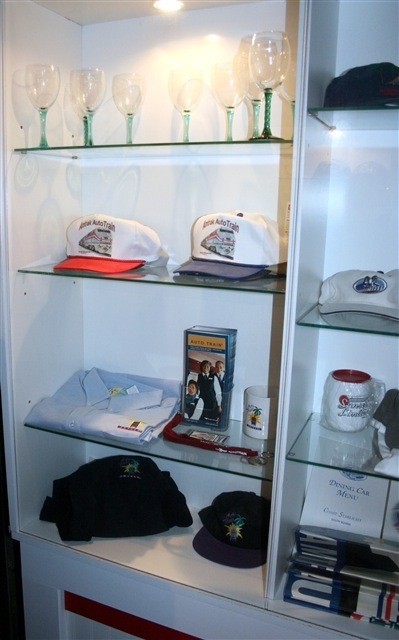 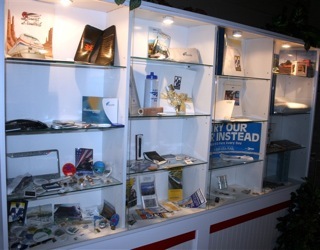 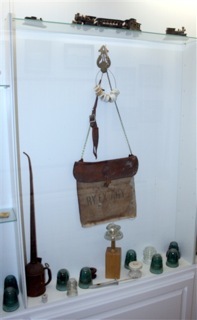 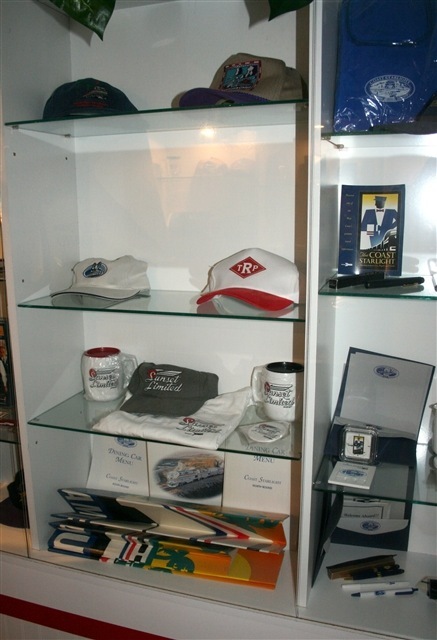 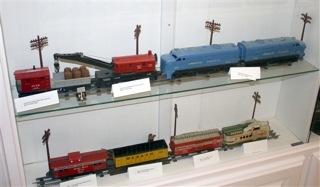 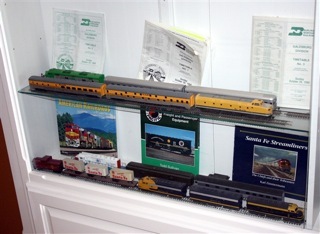 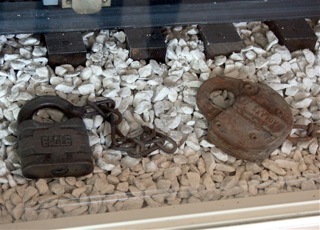 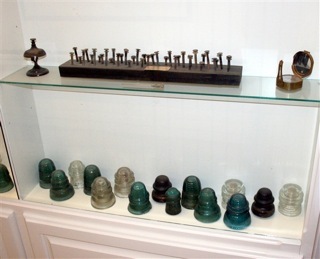 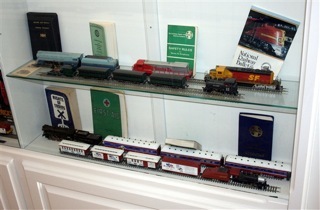 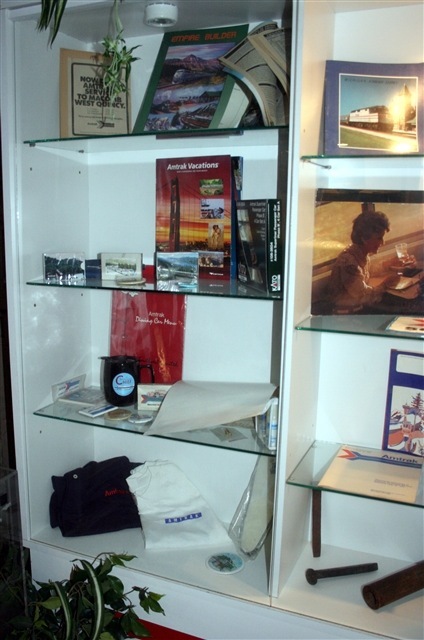 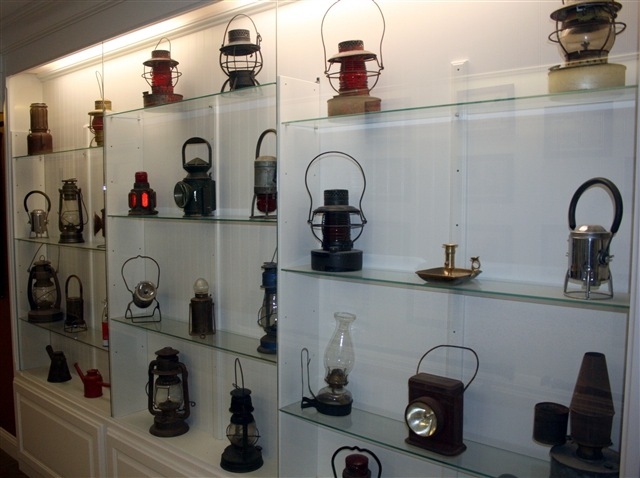 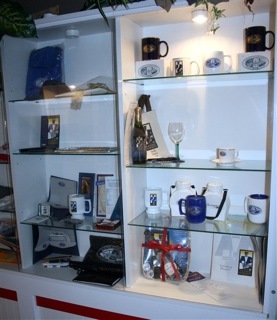 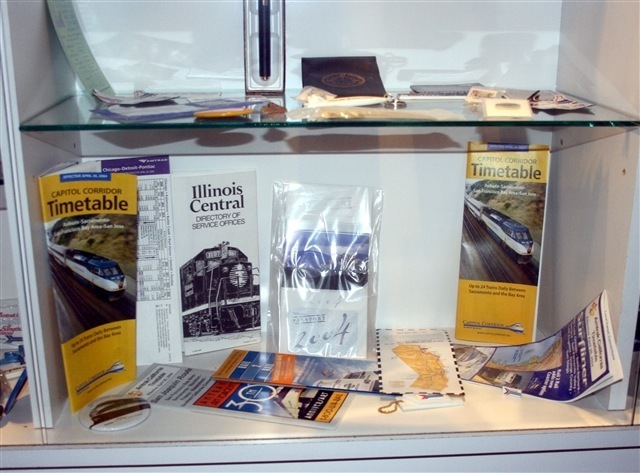 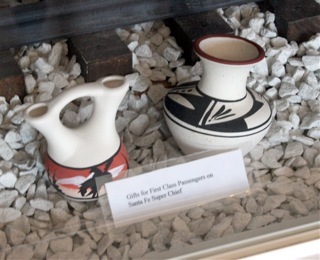 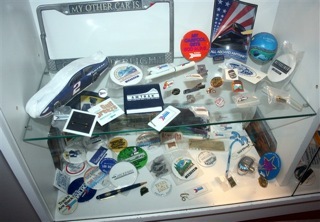 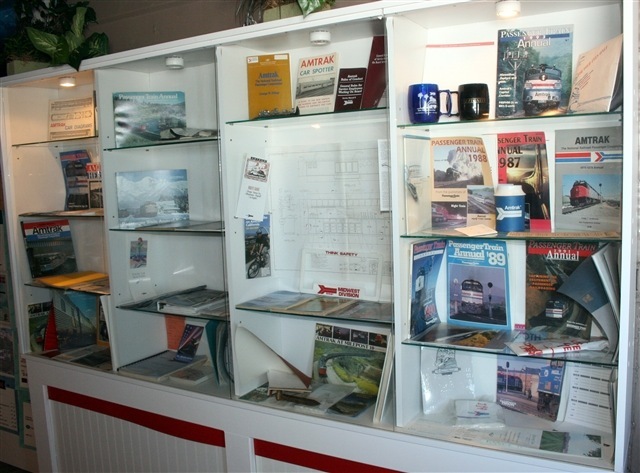 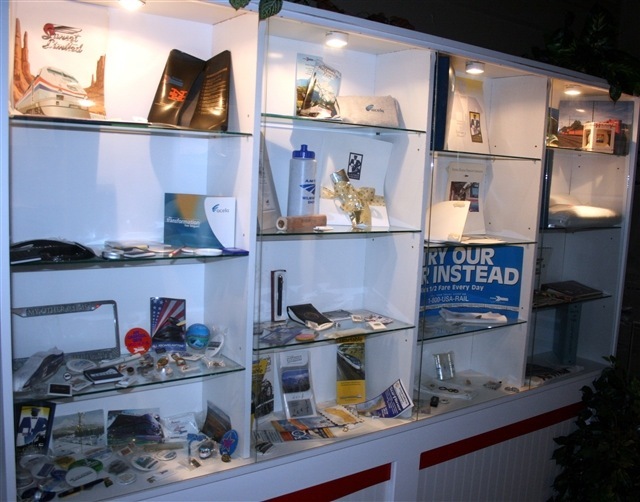 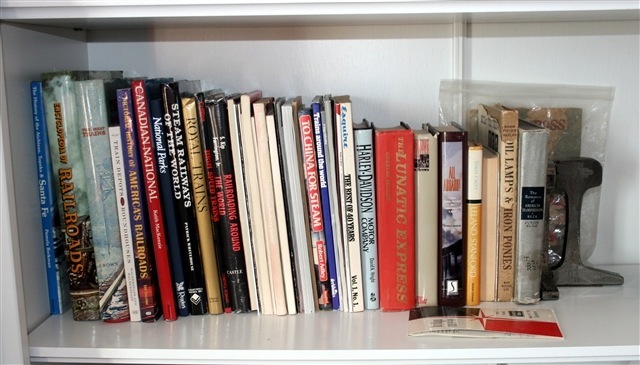 Around the walls and along a glass case, are numerous train artifacts. I had noticed trucks earlier, but in the afternoon, official word had come that the paths to the Lookout and Amtrak museum cars were plowed. 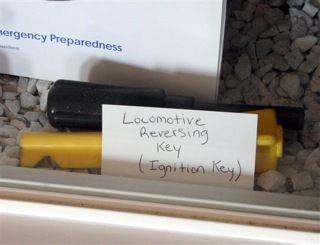 Andrea gave me the key and I was out the back door and walking to the Amtrak mail cars behind the Depot Inn. 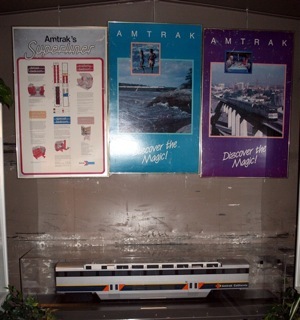 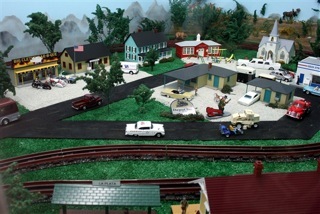 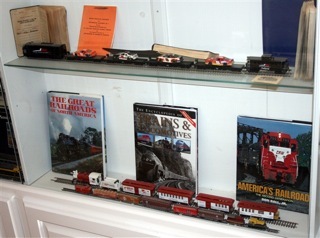 The next series of photos provides a look at the model train display and fantastic collection of Amtrak memorabilia inside the cars. 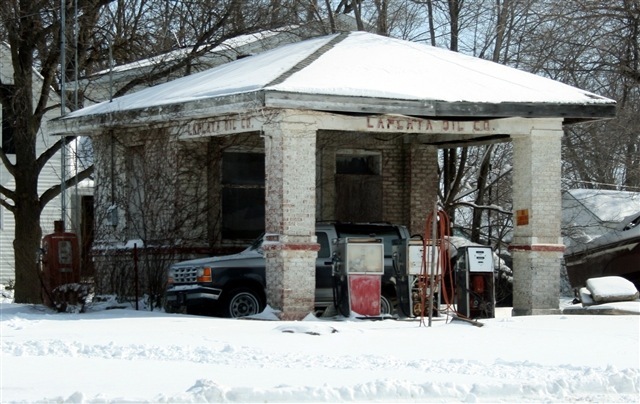 From Wednesday through my train’s departure on Friday morning, I was able to make several runs to the newly plowed Lookout, La Plata Amtrak station, as well as road trips to Marceline, Laclede, Atlanta and Santa Fe Lake. I hope you will join me in Part 3 to continue that portion of my visit. 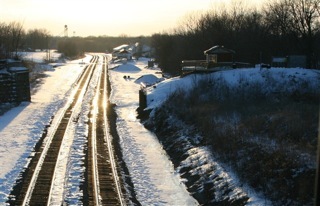 At dusk, the setting sun smiled upon the receding snows of La Plata’s Amtrak station and the Chris Guenzler Million Mile Lookout.